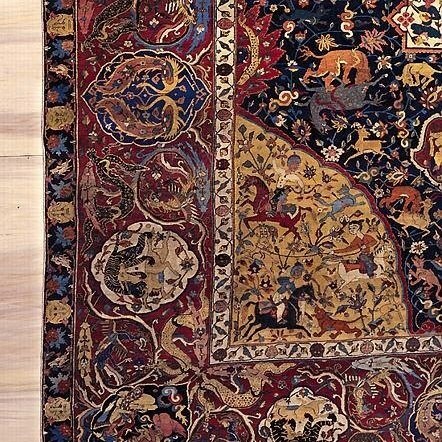 THE CARPET COLLECTION of Albert Hall Jaipur Museum includes this 'Persian Garden Carpet' (pictured here is the first photo of the entire carpet assembled by our RUGDEALER, Shervin Ghorbany), and it is the best and earliest of all such Persian Garden Carpets existing in the world. It was purchased in the time of Mirza Raja Jai Singh I in 1632 A.D. 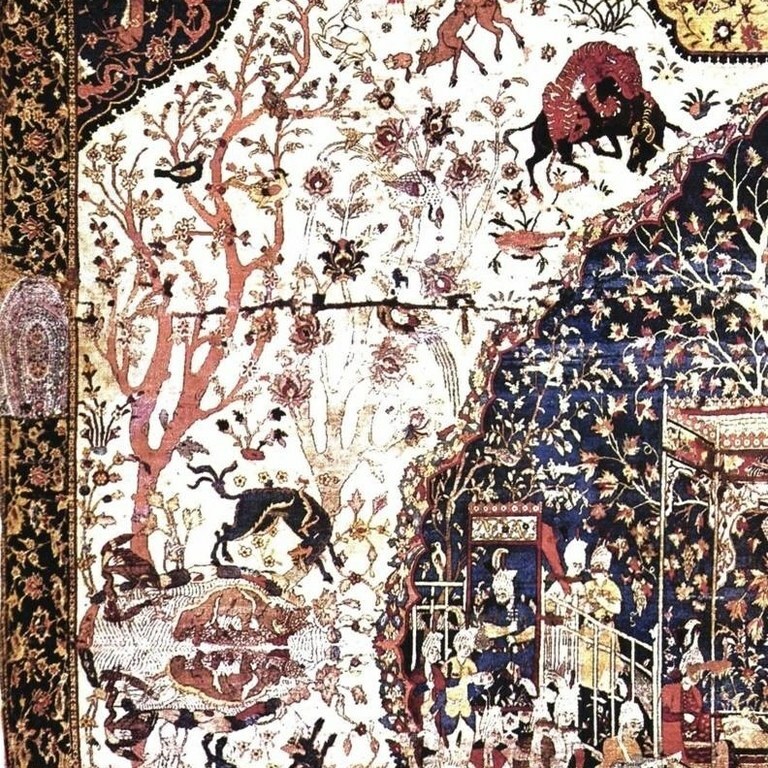 The theme is 'Char- Bagh' / four gardens, showing a tank at the center with animals catching fish from all sides and garden plots in five colours. It's place of origin is believed to be Karman (?) 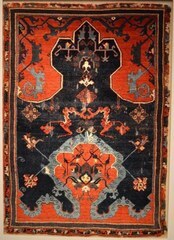 in Persia, a great carpet making center in the early part of the 17th century. The carpet depicts a formal Persian garden, divided by streams into four main garden sections. These are further subdivided into two or more sections with smaller garden plots. There is a pavilion that has a blue dome and richly decorated interior with a throne, from which the Emperor could enjoy a view of the splendid garden. The garden and orchards within are supplied with water from the central tank, with two big ponds on either side of it by the main channel. 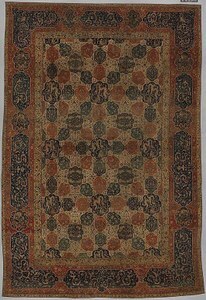 The channel motif appears to have been inspired by the system introduced by Shah Abbas the Great (1526-1628) in and around his capital. 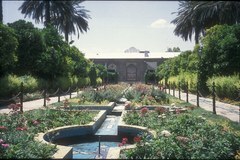 It was known as the 'Isfahan Channel System'. The central tank as picturised, shows fish, duck, turtles and some fabulous Chinese animals. Ferocious beasts appear to break the serenity and peace of the garden when a stag-kylon is cought in the jaw of a lion-kylon. Other ferocious animals include a Chinese monster and a fabulous dragon devouring a fish. As every animal is preying upon another the fish too turn aggressive biting stags and birds. Avenues and orchards of flowering and fruit laden trees adorn the channels and plots, full of birds on the ground, in the air and in nests. While the ground colour of the avenues and much of the carpet is red, the groups of square garden plots around the central tank are in five colours. The group of four garden plots at the top and bottom are in four colours. 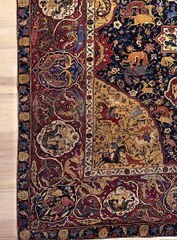 The chequework of varied coloured plots is a unique feature of the carpet and contribute to its incomparable magnificence. The warps are of cotton knotted fourfold, while the weft threads are brown wool and silk knotted twofold. 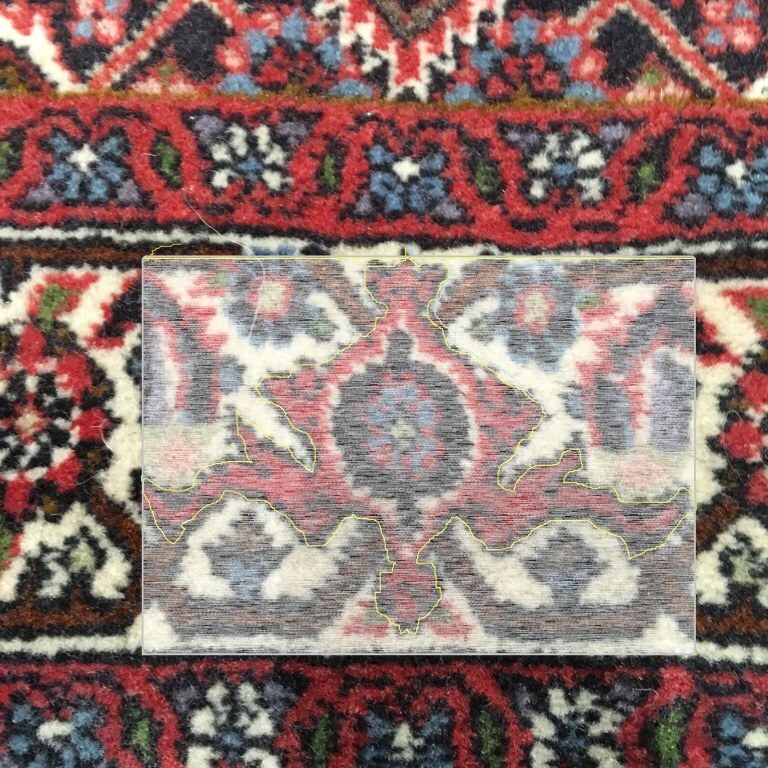 The carpet is 28'4”x12'4” in size. Text is cited from the museum site itself. 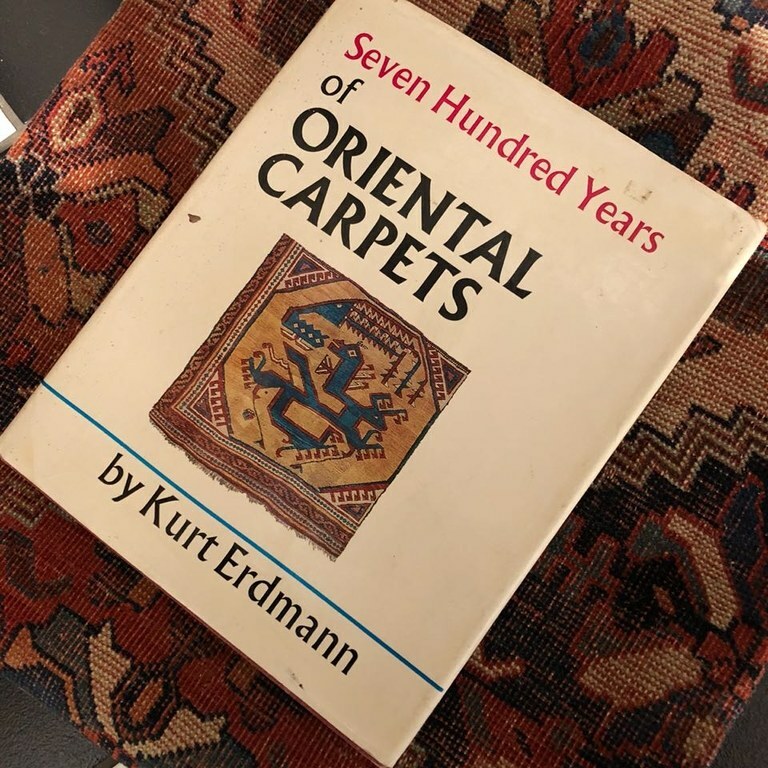 For centuries the only contact Iranians had with the west happened through merchants, predominantly rug dealers, who travelled from east to west and on return to the east told stories of the west to friends and family. The difference in culture between the two sides and the observations made, often made for comical tales. 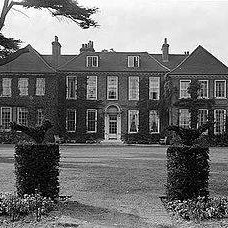 One such tale is that of the first visit of an ambassador of Iran to Britain. 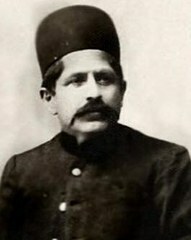 Mr Mirzah Abul Hasan Khan Shirazi was the ambassador of the Qajar Dynasty of Iran and the first to visit Britain. 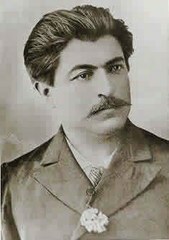 His uncle, Ibrahim Shirazi, was the main character who helped the Qajar Dynasty to take over power from the Zand Dynasty and was the Prime Minister for the first two Qajar kings. Historically they were landlords and a wealthy family of Shiraz. This helped Mr Shirazi to be chosen as the ambassador of Persia. 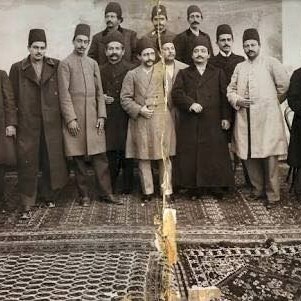 The Persian delegation to Britain was tiny, only eight members made the trip: Mr Shirazi as ambassador, a chef - since the Persians were very concerned about the quality of the food they might have to eat in Britain, two servants, a secretary and three heavily armed guards - since the Persians were worried about their safety when travelling in an unknown country. 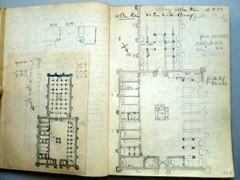 Mr Shirazi kept account of all events as was required by the king of Iran, in his journal. The trip lasted from 1807 to 1816. Persians always chose an auspicious day as the day of departure for such a long journey and for Mr Shirazi’s convoy it took a good 20 days before such a day arrived (with the king’s permission of course), where all celestial signs confirmed that the journey would be favourable if they left on the particular day. When they reached British soil they slept in the best hotel of Plymouth. 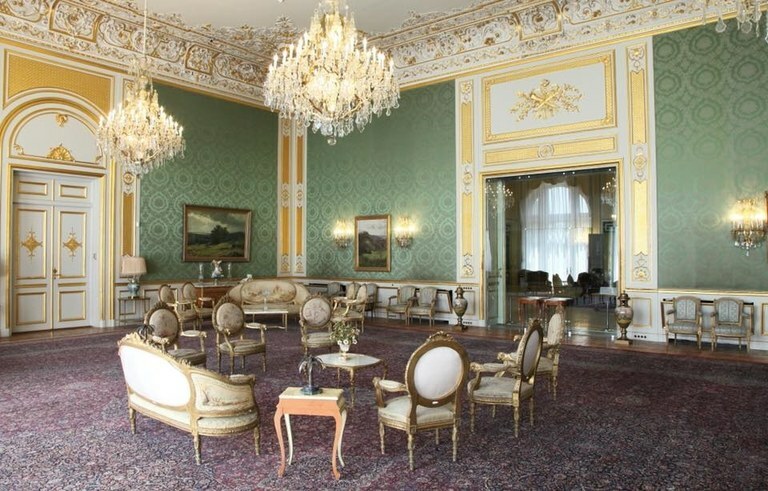 The foreign affairs ministry of Britain made sure that the management of the hotel understood that the ambassador of Iran is a very important man and that he should be treated like a king. 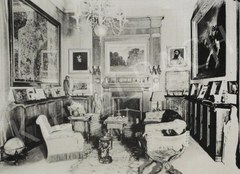 The poor manager assumed that because the visitors came from the Middle East they would be very cold in Britain, so he put multiple blankets and heaters in the rooms to emulate the scorching Middle Eastern heat. Mr Shirazi mentions in his journals that it was so hot in the hotel that he couldn’t sleep and instead walked around his room and the hotel with a whole host of hotel staff following him around (in case he needed anything). The following day the Persian party of eight travelled to London by coach The Persian guards were heavily armed since they didn't know what dangers might befall them in this unknown land. What they were blissfully unaware of was the frightening spectacle they were to onlookers who observed the foreigners travelling through their country with such weaponry. Mr Shirazi wrote how impressed he was with the speed of the British coaches but his amazement soon turned to dismay when on their arrival in London there were no Londoners lining the streets to greet them. This was one of the elaborate customs in Iran, the entire population of the capital would come out to meet any foreign king or dignitaries on their arrival. Mr Shirazi interpreted the lack of such a spectacle as a "cold welcoming" by Britain of Iran and as much as the British reps tried to explain that it is not British custom and thus the lack of Londoners welcoming the ambassador is not a sign of disrespect, the ambassador was convinced that this is indicative of Britain giving Iran the cold shoulder. 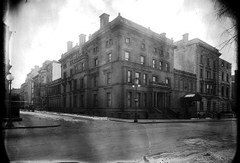 He repeatedly told the British rep that he himself is not upset by the cold welcoming of the Londoners, but he would not know how to explain this to the Persian king without causing trouble in the relations of the two countries.The British Foreign Affairs provided the best hotel to the Persian delegation and even though they received the best service, the ambassador never stopped complaining about the cold welcoming in Britain that he received. After two days of arrival, Mr Shirazi became anxious to take the letter of the Persian king to the king of Britain, since any delay would show even more disrespect and he may be beheaded for this on his return to Iran if he records this in his journals. As luck would have it, the king of Britain was ill at the exact time of the visit and that is what caused the delay in meeting the Persian delegation. After a few more days, the ill king of Britain made an effort to meet with the Persians. Mr Shirazi thought that the British king George III would be exactly like the kings of Persia with the same customs, for example the king of Persia is not easy to meet in his palace. When a person is lucky enough to get the opportunity to meet the king, he should walk very cautiously towards the king and constantly bow to the king, at a certain point he needs to remove his shoes and await permission to approach the king whilst the king is sitting on his throne. If he is lucky enough to be granted this permission by the king only then would he be allowed to move closer. 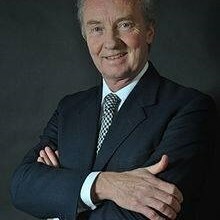 If any foreign ambassador visits Iran, they would never be granted permission to give their king’s letters directly to the king as they would deal with the prime minister instead. 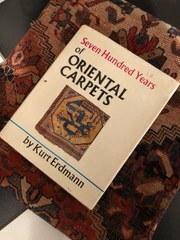 So when the ambassador of Iran entered the room in the palace that he was shown to, he assumed that the old man waiting in the middle of the room was the butler to the king, who would tell him when to remove his shoes and direct him to the king’s throne room where he would await permission to approach the king to hand him the letter of the king of Iran. Imagine his shock when the British rep told him that the “old butler” is in fact the king of Britain. How amazed he was to be granted such close unsupervised contact with the king so easily. After this trip, he returned to Iran and luckily did not lose his head. Instead he became the foreign minister of Iran some years later. Iran has had its fair share of regime changes and challenges of territory and throne often resulting in short lived dynasties, but every now again a new Persian dynasty would form that would stand the test of time and withstand threatening forces and assassination attempts. The first such empire of course is the Achaemenid Dynasty formed by Cyrus the Great in 500BC, Next we have the Parthian Dynasty who took Persia back from the Greeks in 247BC. Following them were the Sassanid Dynasty that ruled from 224AD until the Arab Invasion in 651AD. The next great Persian Empire started with the Safavid Dynasty that ruled Persia from 1501AD until 1736AD. After the decline of the Sassanids the Afsharid and Zand Dynasties each had a short lived rule over vast territories of Iran, but it would be the Qajars that would again form a long lasting dynasty in Persia in 1789AD. They would also be the last to do so. 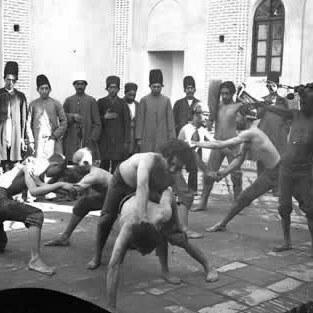 The Qajars ceased the throne of Persia in 1785 and the first decades of their rule was bloody and brutal. After the dynasty crushed any resistance and regained control of all areas of Persia as it was at the time of the Safavids (and more), their rule became more settled and peaceful. There are a lot of art legacies from the Qajar times, from portraits to architecture that is exquisite and awe inspiring, yet the economy of Iran started to decline in the late 19th century and the people became restless. They pushed for reforms and wider freedoms across all classes but the shah of the time, Mohammad Ali Shah, would not agree. After he was successfully exiled to Russia his 11 year old son, Ahmad Shah, was placed on the throne. Due to his young age his uncle acted as his guardian and adviser during his rule as king. Unfortunately for the young king, the world was in turmoil and with a threatening Russian force invading Persia and lack of cohesive decision making, the power of the Qajar kingdom diminished over time. Persia started losing ground and this gave rise to military intervention from the Persian Army to regain the strength of the country. 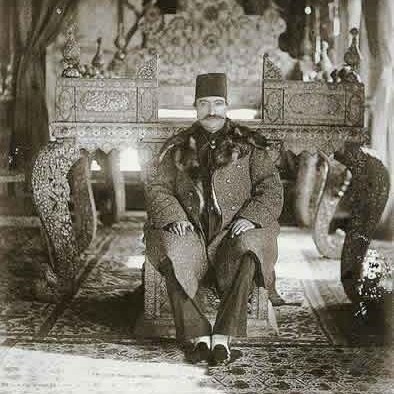 In 1923 Ahmad Shah Qajar traveled to Europe on an "extended holiday" and was successfully overthrown in a bloodless coup by Colonel Reza Khan, later known as Reza Shah Pahlavi, whose line would be the last line of kings of Persia before the revolution in 1979. This marked the end of the last longlasting Persian Dynasty, Qajar, in 1925 after ruling Persia for 136 years. The boy king died in exile in France in 1930 due to ill health. 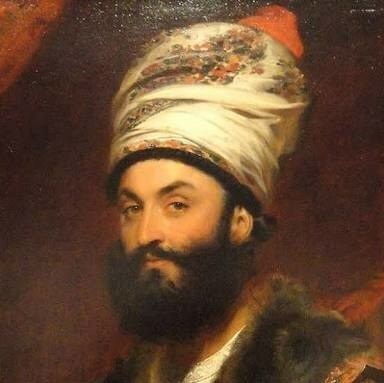 His wish was always to return to Persia and continue his reign until his last day, but he never recovered from the sadness of being exiled from his beloved Iran. 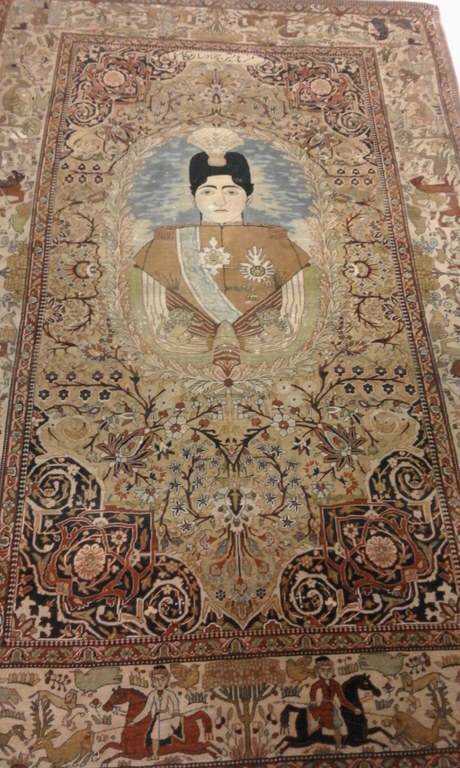 This carpet of his image was woven in Kashan over 100 years ago at the time of the reign of Ahmad Shah Qajar - Ghorbany Carpets Private Collection. If you know Iranian food you will know that saffron plays a massive role in the overall cuisine from sweet to savoury dishes. Saffron is the most expensive “spice” in the world, it is worth its weight in gold (starting from $811 per kg), and yet in Iran there are many dishes that require this ingredient. 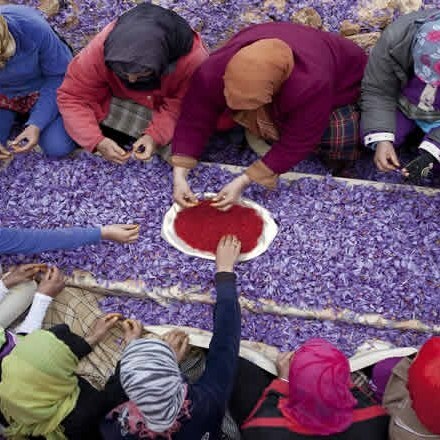 It is not necessarily cheaper in Iran than anywhere else, but since 85% of the world’s saffron is grown there Iranians have various different grades of saffron to choose from and through time they learnt how to use saffron sufficiently but sparingly in their cuisine. Through millennia saffron was not only prized as an ingredient for delicious food, but it was also highly prized as a dye stuff and medicine. The oldest known example of the use of saffron (as a paint) is in a 50,000 year old cave art illustrating beasts, in modern day Iraq. In ancient Persia, saffron (Crocus sativus 'Hausknechtii') was cultivated at Derbena and Isfahan in the 10th century BC. 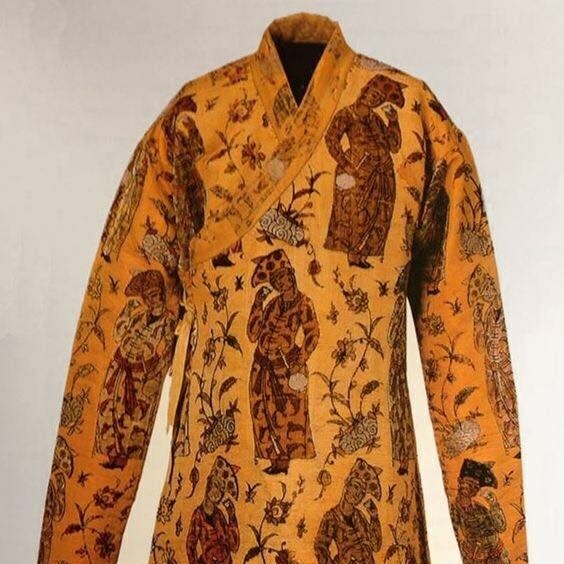 It was used as a brilliant yellow dye in royal Persian carpets as well as funeral shrouds and also as perfume, medicine and ritual offerings to deities by ancient Persian worshippers. Saffron threads were even scattered across beds and mixed into hot teas as a cure for melancholy. 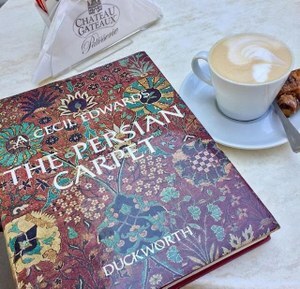 Foreign travellers to Persia, however, were widely suspicious of it as they believed it to be a drugging agent and an aphrodisiac, so much so that travellers were fore-warned not to eat the saffron-laced Persian cuisine. In addition, Persian saffron was dissolved in water with sandalwood to use as a body wash after heavy work and perspiration under the hot Persian sun. 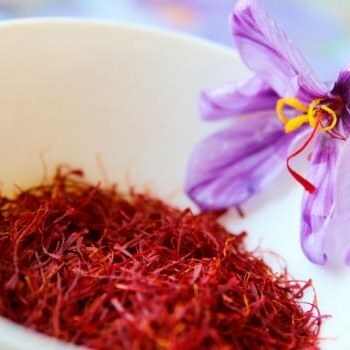 Its medicinal qualities were so revered that even Alexander the Great used saffron sprinkled in his warm bath water believing, like Cyrus the Great before him, that it would heal his many wounds and his faith in saffron grew with each treatment. He even recommended saffron baths for the ordinary men under him. The Greek soldiers, taken with saffron's perceived curative properties, continued the practice after they returned to Macedonia. From Persia it spread to many different regions where each starting growing its own variant, but Iranian saffron is still regarded as the best in quality today. So what about saffron makes it so expensive? Firstly, the spice comes from the flower of Crocus sativus, commonly known as the "saffron crocus" and is a triploid. It can’t grow in the wild or reproduce without human intervention. Secondly, the gorgeous purple flower is painstakingly propagated and the threads harvested by hand only on the morning it blooms. The more careful the cultivation, the higher the price. The threads are then collected and dried to be used mainly as a seasoning and colouring agent in food. Thus to grow and cultivate this plant is a long and arduous process that require many man hours to succeed. 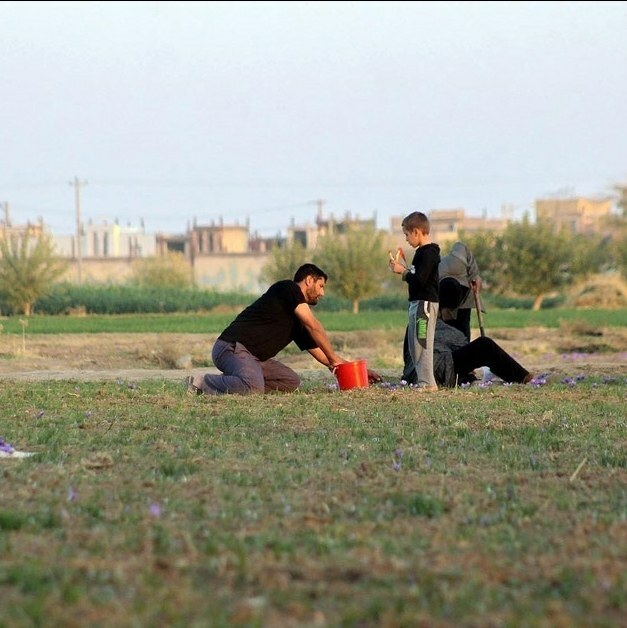 Gonabad is the main saffron growing region in Iran and it is a dry region with almost no rainfall. To solve the problem of providing water for the saffron crocus, the ancient Persians thought of an ingenius idea to ensure sufficient water supply to this very popular and exclusive spice and other agrecultiral endeavours, they built qanats (a gently sloping underground channel that transports water from an aquifer or water well to surface for irrigation and drinking. Qanats still create a reliable supply of water for human settlements and irrigation in hot, arid, and semi-arid climates today). The Qanats of Gonabad is ofcourse one of the oldest and largest qanats in the world built between 700 BC to 500 BC, and is still in use today. 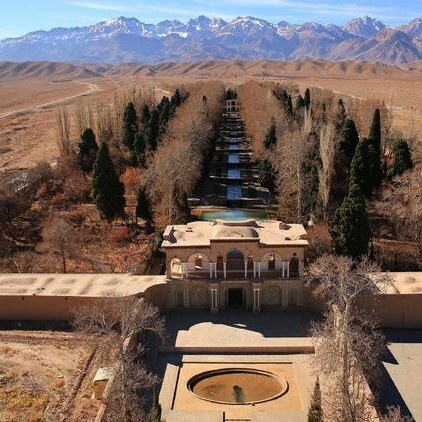 This site was officially added to the UNESCO's list of World Heritage Sites in 2016 with several other qanats under the World Heritage Site name of "The Persian Qanet”. 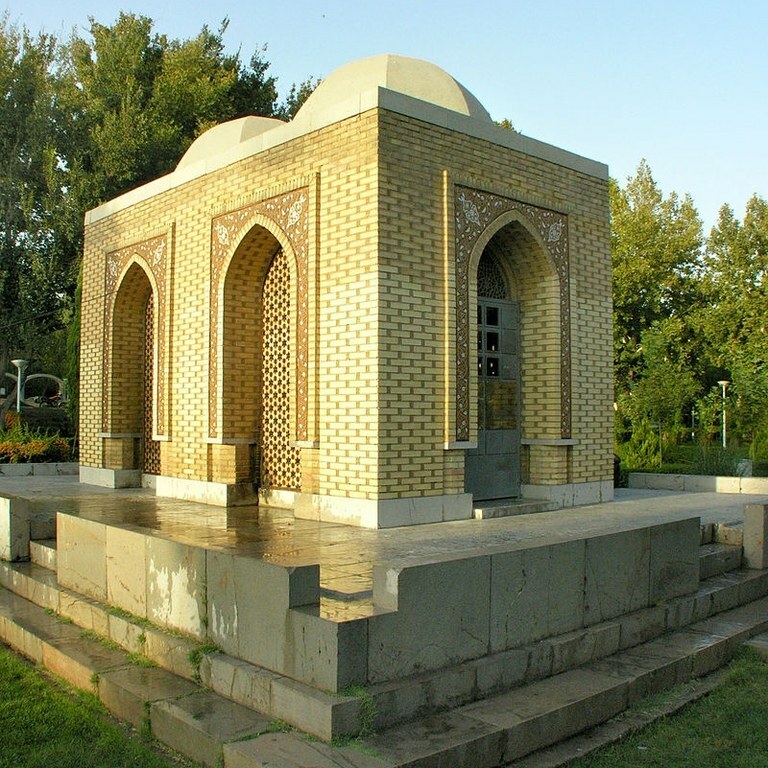 In the time of the Achaemenid Dynasty there was a ruling that someone who succeeded in constructing a qanat and bringing groundwater to the surface in order to cultivate land, or in renovating an abandoned qanat, would not need to pay the government any taxes for up to 5 generations after him. Thanks to this engineering feat the cultivation of Persian saffron succeeded and grew through the ages to such an extent that Iran is now the largest producer of saffron in the world, together with pistachio, berberis (zereshk), caviar, stone fruit and berries. I recently watched the documentary of the late Anthony Bourdain’s visit to Iran that we posted on this page earlier this month and I had to chuckle about his confusion of the politeness of the people in Iran and their unbelievable kindness to strangers. Anyone who has ever had Persian friends or neighbours or family knows this: Persians are amongst the friendliest people in the world! It is more than just being polite and kind, complete strangers will welcome you into their home and go above and beyond any hospitality you have ever experienced in your life. So many westerners are completely awestruck and baffled by this and no matter in which country you meet Iranians, their behaviour is always the same, it’s universally Persian. I thought about this and my own experience of marrying into a Persian family and it struck me that this is why the Persian culture has survived for thousands of years. Persians will literally go out of their way to accommodate or help you in any way shape or form. Instead of giving you directions somewhere, they will leave everything to take you there themselves. 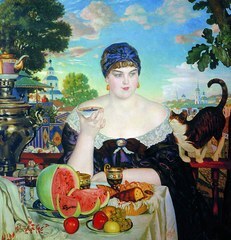 A offer of having tea will often become a dinner invitation. They will offer your their bed and sleep on the floor, all just to make sure that you as their guest (which almost certainly means "new friend") is fully content. If you ever get invited to an Iranian home you will be overwhelmed by the friendliness of the people and their shear happiness to host you. You can be sure that you will be treated like royalty for the entire night! A huge part of the evening will be dedicated to Persian cuisine that is their pride and joy. Iranians did not have a restaurant culture until recently, so all their dishes are home made with a lot of love. All Iranians know how to cook the same favourite dishes, and they are many and varied, so no matter where you meet them in the world you will be treated to these dishes cooked at home in the same way for centuries, with recipes passed down from one generation to the next. Every dish is cooked from scratch with fresh ingredients and most dishes take 6 hours or so to cook, some even up to 24 hours and a few very special ones can take up to a week. It does not end with cooking every dish, the dishing up and decorating of each is very special as well. Great attention to detail is given to each dish and the garnishing of it with beautiful and special ingredients, almost certainly dished up in exquisite handmade Iranian dishware. One of the most important components is of course the Persian rice cooked to absolute perfection in a rice cooker and the cherry on top is the crispy layer at the bottom (called tadik) that is the pride and joy of every Persian cook. You will be forgiven for thinking that you have stepped into an elaborate medieval banquet when you enter the Iranian dining rooms, the sheer variety and volume of the dishes can be overwhelming! But the more food there is, the greater their happiness to host you. Indulging in the main course is not the end or beginning of your night with Persians. When you arrive the starters are as many as the main course. Seasonal fruits of all kinds and fresh herbal salads are a must at any Persian party, as is the yoghurt flavoured with different ingredients, some with cucumber and garlic, others with peppers and garlic and so the varieties continue. There is lots of singing and dancing before the main course and most definitely an Iranian instrument (like their drums “daf”) will be played to classic and modern Persian songs. Iranians are happy to have friends and family over and the rejoicing with song and dance is almost as important as the feasting on the main course. You will be pulled onto the “dance floor” and taught to strut your Persian dance moves and if you succeed your hosts will reward your efforts with loud praise and applause! 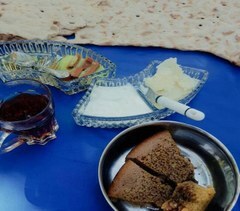 After the main course, it is time for the ever important Persian tea and of course deserts. 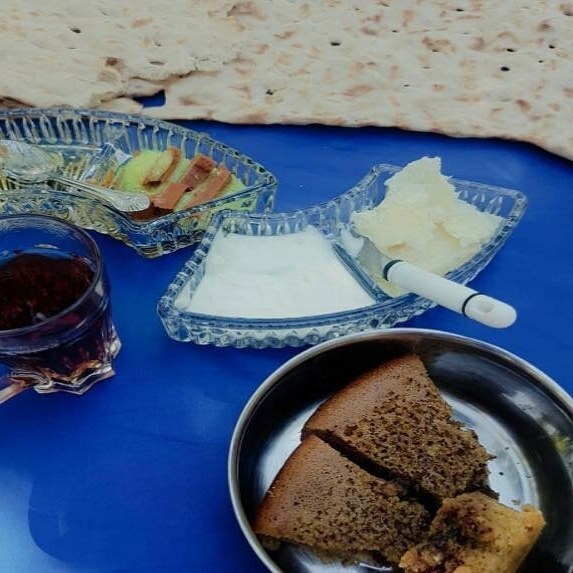 Because of the volume of food of the main course, the deserts are not as many or varied and if you are lucky you will be served Iranian cookies and sweets that are often made with rose water, saffron and pistachio nuts, if these are available in the specific country. You are most certainly going to be treated to baklava. The serving of the tea is very important. It must be just the right colour served in a clear cup (most of the time beautifully decorated ones from Iran) and enjoyed with a small bite of something sweet, often a sugar cube or sugar crystal from Iran. You can be sure that there will be enough sweet things to indulge in if you still have a little hungry spot after the mains, which I seriously doubt! One thing is for sure, it will be an experience that you will never forget (for the right reasons!) and it will be one of the occasions that you will feel very special! But their hospitality does not just revolve around food and dance. Persian politeness is known the world over. They do not like harshness of any kind and certainly not unkind words or behaviour. Their treatment of you will always be with the greatest of respect no matter under which circumstances. 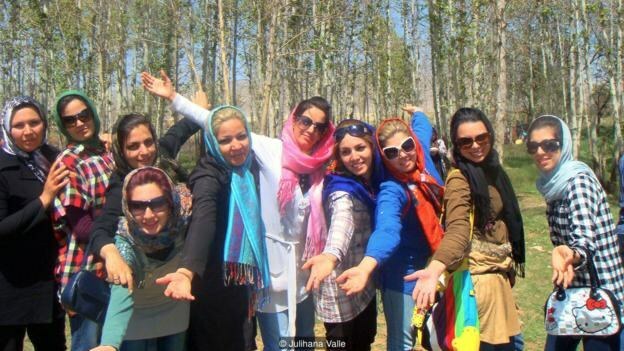 “For Iranians, kind words are always important. Maybe it is because our Persian spirit carries a lot of poetry in it. Our most important thinkers are poets, most of them very ancient, and a language full of kindness and praise is still today present in our readings.” explained Iranian artist Fereshteh Najafi in a BBC interview about "The Persian art of etiquette". The ugliness of mankind is something that Persians have tried to soften through all the centuries with their beautiful artforms. 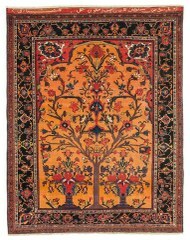 Bringing a kind element and beauty to the cold starkness of reality is probably the greatest Persian art of all! No matter what the media says, once you meet Iranians you soon realize that many things portrait in the media about them simply aren’t true. Often in the west we have preconceived ideas about the Middle Eastern countries and people, simply because their cultures are so vastly different from ours, they are the unknown frontier to us. Yet majority of these countries are the oldest in the world with civilizations stretching back millennia. Persia should be thanked for so many inventions that we still use today and yet, history often does not reflect this fact. A great example of Persian hospitality is that of Cyrus the Great who established the first great Persian Empire in the 6th century BC. As a new powerful force the Persians had to defend their borders or yield to other kingdoms and that led to the expansion of the Persian Empire that would eventually encompass 40% of the world’s population. The Persians however did not expect all their new territories to become Persian, rather they allowed each region to rule itself and the people to worship their own deities and this led to the writing of the first human rights charter. This charter is recorded in the UN building and it is still aspired to today. It is a brilliant indication of how welcoming Persians are to others and why Cyrus the Great is still viewed as the messiah of the Hebrews and the greatest king Persia ever had. The Persians themselves have been invaded so many times throughout their history by so many vastly different forces, that it is truly incredible that their culture and identity is still so strong today. Maybe that is exactly the reason why. Being subjected to so many different new leaders and cultures most likely makes you cherish and hold onto your own. The ingenious method of the Persians to charm their invaders to such an extent that the invaders often became preservers of the Persian culture themselves, is simply admirable and the reason we can still enjoy this rich culture. Being a major power on the Silk Road and inviting so many foreigners into their borders naturally added to the Persians’ hospitability. This is a nation of merchants and negotiators, middle men and scholars, entertainers and storytellers, craftsmen and artists who were often employed in other Empires as advisors in court because of their knowledge and neutrality. From afar the culture may appear very conservative, but it is the desire to maintain the Persian identity that makes them so protective of it. And thank goodness for that! Because of their pride in their history we can enjoy their unbelievable hospitality! Perhaps it is having learned over time that kindness can win over any hostility and eating delicious food together can warm the coldest heart that created this beautiful and powerful hospitable culture. 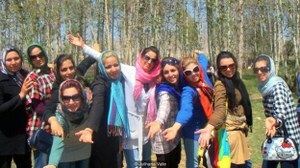 It is something they practice daily even with other Iranians and it is, sadly, something that we in the west will never see or know until we meet a Persian. 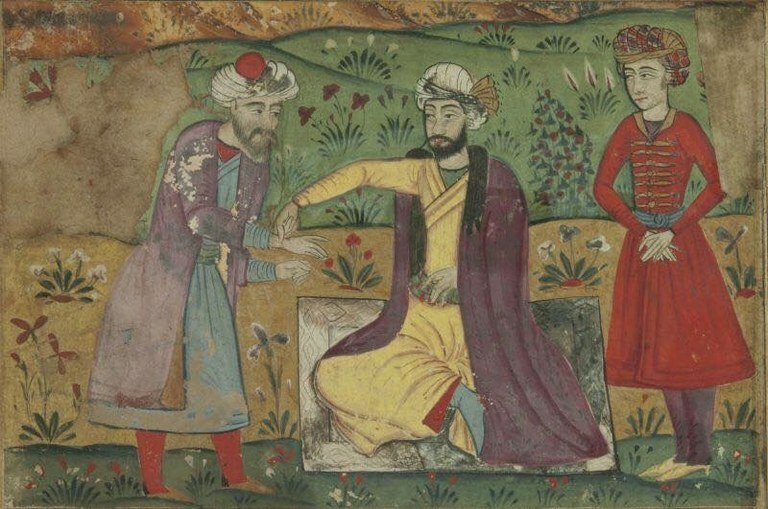 The Keir Collection came to the DMA on a long-term loan agreement with the trustees of the Keir Collection that was finalized in 2014, transforming the Museum into the third largest repository of Islamic art in the United States. The Collection is on show from April 18, 2017 to April 26, 2020. 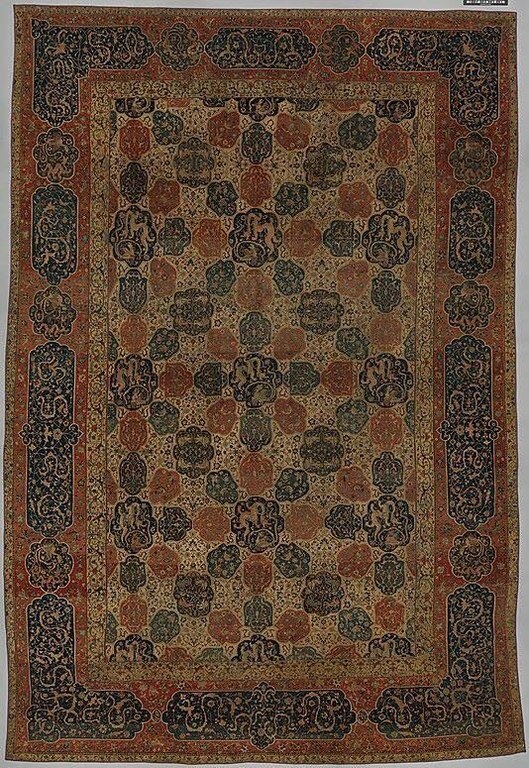 The Keir Collection comprises works from nearly all periods and artistic styles from the core Islamic countries around the Mediterranean, from Iran and Central Asia. Brocades and carpets, early medieval bronzes, exquisite rock crystal objects, priceless calligraphies, miniatures and elaborately adorned bookbindings all feature in the loan. One of its most striking attributes are its ceramics dating from all periods – one good reason alone for the world renown of this private collection. 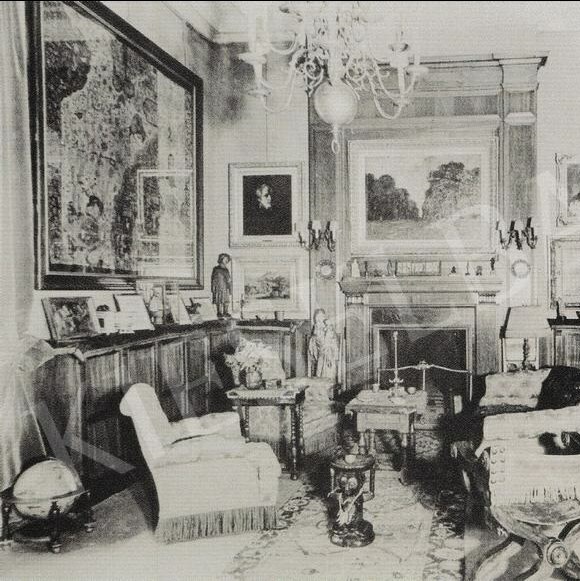 What is also astounding is the story of the person behind the Keir Collection, Edmund de Unger. Who was Edmund de Unger? 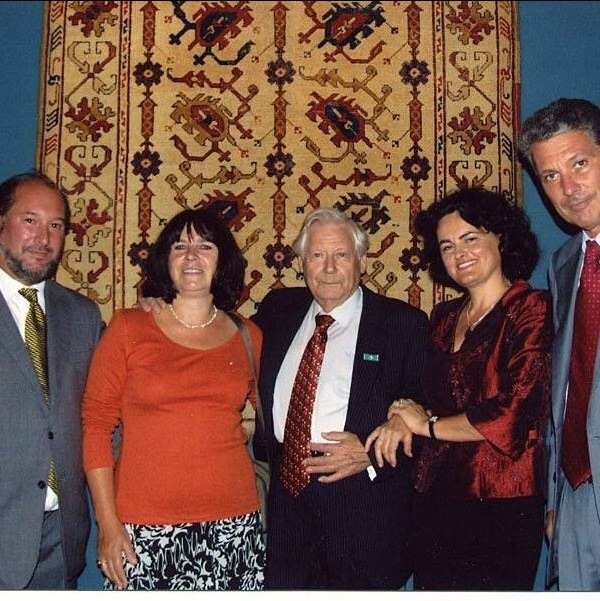 Edmund Robert Anthony de Unger (Hungarian: Odon Antal Robert de Unger, b 6 August 1918, Budapest - d 25 January 2011, Ham, Surrey) was a Hungarian-born property developer and art collector. 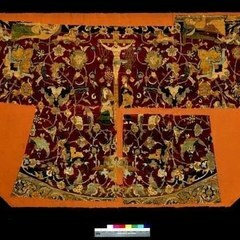 In London he built up the Keir Collection, one of the greatest post-war collections of Islamic art, bequeathed in 2008 to the Pergamon Museum of Islamic Art in Berlin. 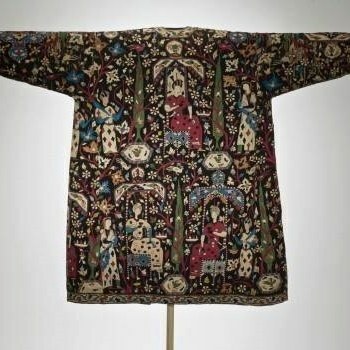 The arrangement for the museum to curate the collection came to an end in July 2012.The collection is now hosted by the Dallas Museum of Art as of May 2014 for a 15-year renewable loan. 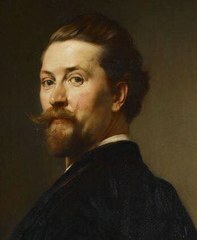 Edmund de Unger was born in Budapest into a family linked with the art world. His father was a private collector of carpets and another relative was the architect who designed the Hungarian National Museum. After going to London in 1934 to learn English, he studied economics at Kiel Institute for the World Economy, law at the University of Budapest and history at Hertford College, Oxford. 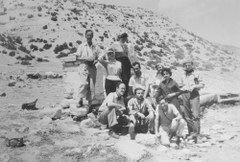 Returning to Hungary before the outbreak of World War II, in 1945 he married Eva Spicht, one of 22 Jewish refugees whom he had taken in during the Battle of Budapest. After the war he restored and ran the Astoria Hotel in Budapest, until it was requisitioned by the communist regime in 1948. 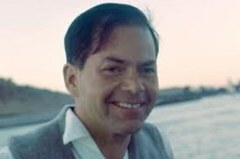 In 1949 de Unger, following a series of arrests in Hungary, moved permanently to England, working first as a manservant. After further training, he entered the legal profession as a barrister. 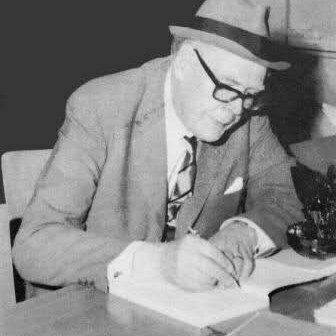 He later worked as Crown Counsel in Ghana for the Colonial Office. The period in West Africa permitted visits to Egypt, where he developed an interest in Coptic and Islamic art. 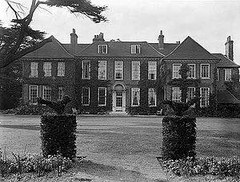 On returning to England, de Unger became a property developer, which provided him with the means to build up his post-war art collection, which he named the "Keir Collection", after one of his first homes The Keir on Wimbledon Common in London. 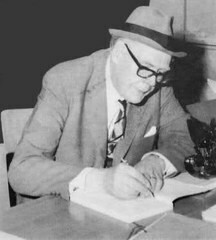 In 1965, following the death of his first wife Eva in 1959, he married Elizabeth Allen, with whom he had two sons, Richard and Glen. The modern day Suez canal in Egypt opened on 17 November 1869, brought a welcome thoroughfare connecting the Mediterranean Sea to the Red Sea through the Isthmus of Suez. It offers watercraft a shorter journey between the North Atlantic and northern Indian Oceans via the Mediterranean and Red seas by avoiding the South Atlantic and southern Indian oceans, in turn reducing the journey by approximately 7,000 kilometres. A lesser known fact is that the Suez canal of today is an ancient concept. The legendary Sesostris (likely either Pharaoh Senusret II or Senusret III of the Twelfth dynasty of Egypt) may have started work on an ancient canal joining the Nile with the Red Sea (1897 BC – 1839 BC), when an irrigation channel was constructed around 1850 BC that was navigable during the flood season, leading into a dry river valley east of the Nile River Delta named Wadi Tumelat. It was called the Canal of the Pharaos. 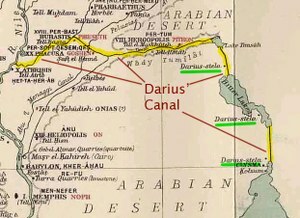 A later canal, probably incorporating a portion of the first, was constructed under the reign of Necho II around 600BC, but the only fully functional canal was engineered and completed by Darius I of Persia 500 BC. 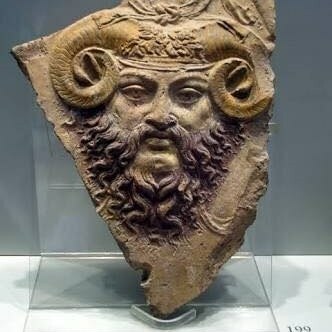 "King Darius says: I am a Persian; setting out from Persia. I conquered Egypt. 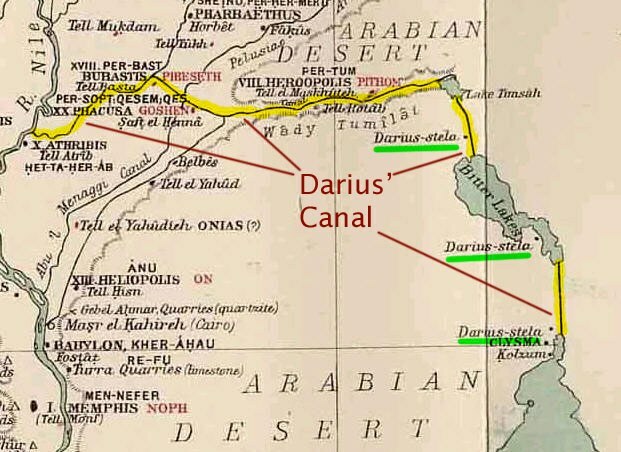 I ordered to dig this canal from the river that is called Nile and flows in Egypt, to the sea that begins in Persia. Therefore, when this canal had been dug as I had ordered, ships went from Egypt through this canal to Persia, as I had intended." 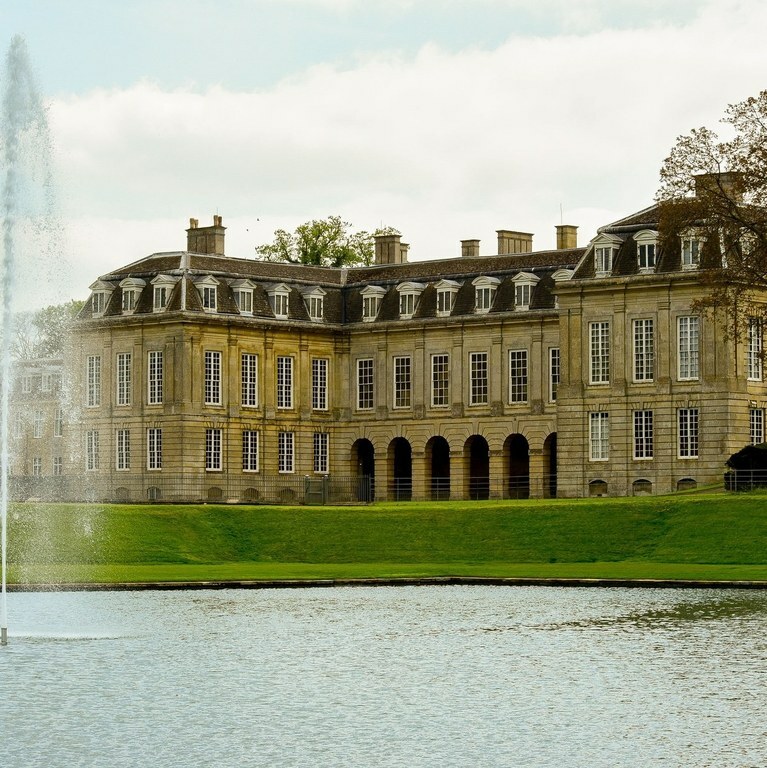 Let your passion for rugs take you here: The Boughton House which is situated off the A43, three miles north of Kettering, through the village of Geddington, Northamptonshire ,Britain and experience ‘The English Versailles’. 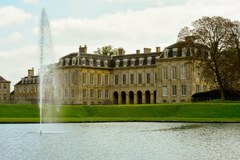 Discover one of Britain’s grandest and best-preserved stately homes. As well as the splendors of the House, you can also enjoy the 18th-century landscaped gardens, woodlands and a grand country park. It is open every Easter and August for guided tours and at other times of the year for special events. Groups can visit year round by appointment. 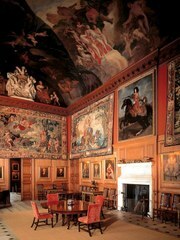 The Herald reported that the Duke was Scotland's largest private landowner, with some 280,000 acres (110,000 ha).The Buccleuch carpet is classified as the Sanguszko carpets, of which more than a dozen examples are known, are distinguished by figurative decoration closely tied to manuscript illustration, a bright appearance owing to abundant use of white in the pile, and certain technical peculiarities. 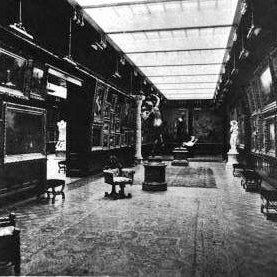 The group owes its name to the former owner of one magnificent example of the group (currently on loan to The Metropolitan Museum of Art, no. 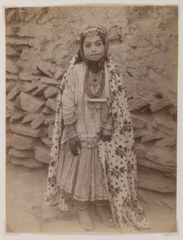 L1985.3; Survey of Persian Art, pl. 1206). 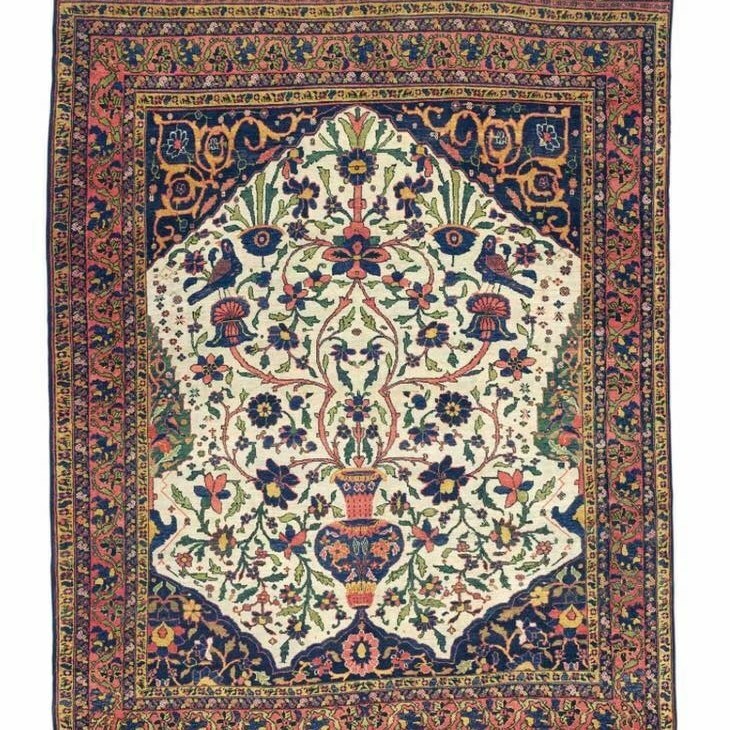 Medallion designs with symmetrically arranged floral patterns predominate, but directional designs with figurative motifs are also found. 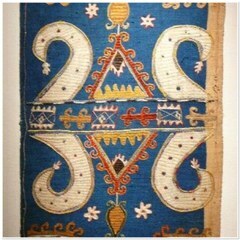 Animal-combat motifs are plentiful, and animal heads often inhabit palmettos and border designs. 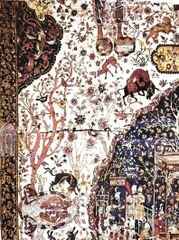 Clusters of human figures embellish discrete compartments in the field or border; some of these figures can be directly linked to manuscript illustrations, for example, scenes from Laylī o Majnūn and images of fighting camels, a popular subject first seen in an early 10th/16th-century painting by Behzād. 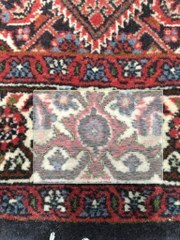 Technically the Sanguszko pieces resemble the so-called vase carpets with cotton warps and wefts of wool and silk, but they differ in other ways. 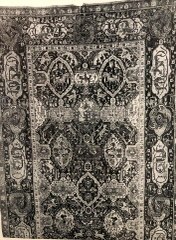 The localization of this group is highly conjectural; Kāšān, Yazd, Kermān, and Qazvīn have all been suggested, but certain differences within the group suggest that these carpets were produced at more than one weaving center. A date late in the 16th, or perhaps even early in the 17th, century seems plausible on the basis of the figure style and the existence of Indian copies that probably date from the early 17th century. 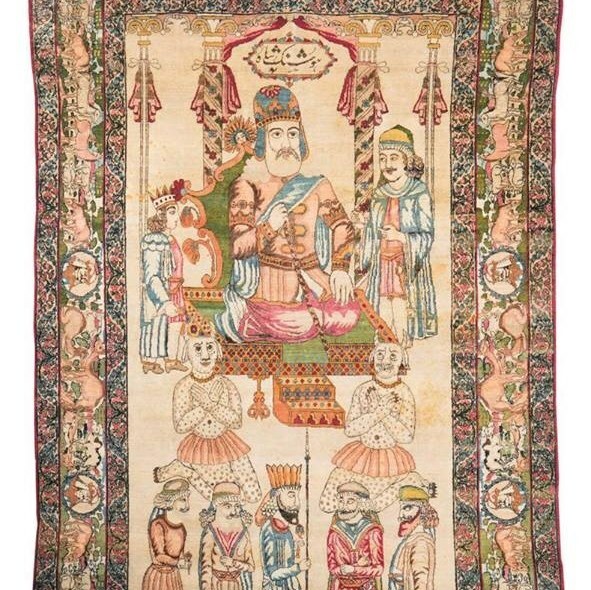 In the upcoming Wannenens Auction in Milan on 7 June 2018, Lot 97, there is a Kerman carpet (circa 1900), size: 230x140, showcasing Hushang Shah (a prehistoric Iranian king that we discussed before). 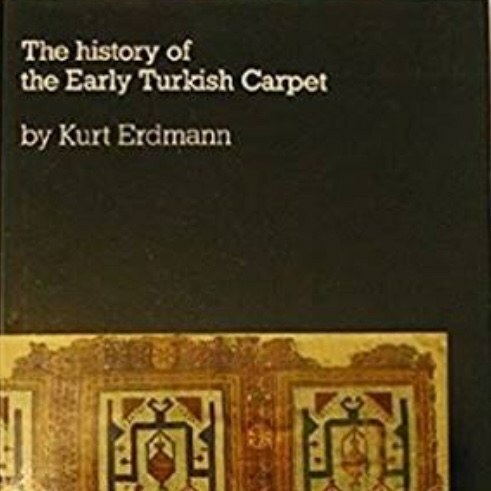 What interested me most was the cartouche on the top of the carpet mentioning that the carpet was made "By order of Jahanian". To understand my interest, I would need to take you back to the history of banking. Banking in Iran has traces back to pre-Achaemenid times when money lending was done by temples and princes. 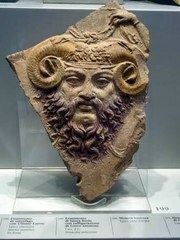 Once Babylon became part of the Achaemenid Dynasty the Iranians learned some new banking skills from them and there are records indicating money sent from Babylon to Larsa. In Greece there were some banking laws permitting money lenders to charge interest. The Romans most probably learned banking from the Greeks and the Italians later had exchange bureaus in Lombardy and Venice, with transactions being conducted on small tables in the town squares. These tables were called banco's and thus the origin of the word "banks" came from it. 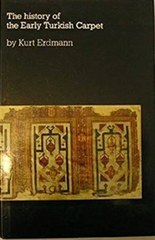 Historian Roman Girshman mentioned that during the Sassanid Era Iranian and Jews of the Empire conducted many monetary transactions with the Royal banks using documents that ordered the bank to pay a specific amount of money to the person in whose name the document was issued. These "notes" were called "cheques" and is the origin of the "cheque" as we know today. 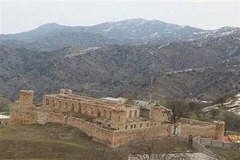 Another banking term originating in Iran is "barat" which was later exported by Syrian Christian Merchants to the west. 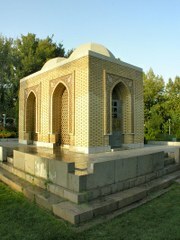 Nasser Khosrow documented in the 11th century that there were 200 exchange bureaus in Isfahan. 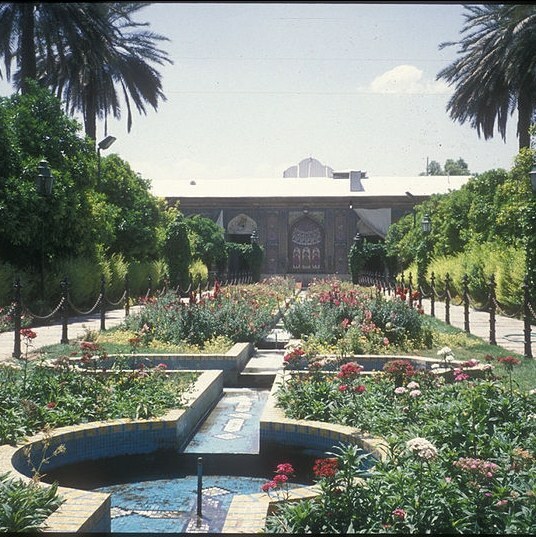 During Safavid times there were also many exchange bureaus in Qasvin and Isfahan with interest rates of 12% for merchants and 24% for ordinary citizens. In Safavid times the exchange bureau owners also issued a document that is similar to credit cards of today, called "bijak". 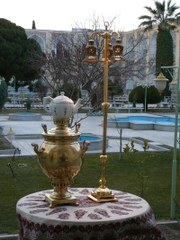 The bearer of the bijak could exchange the bijak for cash at any time and anywhere in Iran. It was much safer to use than to carry actual cash. In Mongolian times the use of printed bank notes, called "chav", became compulsary in Tabriz and few other cities. Around 140 years ago Hajj Muhammad Hossein Aminol Zarb, an exchange bureau owner, requested permission to open the first formal bank in Iran. 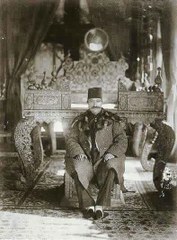 Nasir din-Shah of Qajar, the reigning king at the time, however denied the request. Around 1880 in Yazd there were a few Zoroastrian businesses with the names Jamshidian, Yeganegi and Jehanian (the latter being the person who ordered the above mentioned carpet being auctioned), who were acting as bankers in communities in the absence of a more formal banking system. In 1894 Khosrowshah Jahan and four of his brothers: Parvis, Gudars, Rostam and Bahram - Zoroastrain landlords in Yazd - opened the Institute of Jahanian through which they conducted their general retail and also money exchange services. 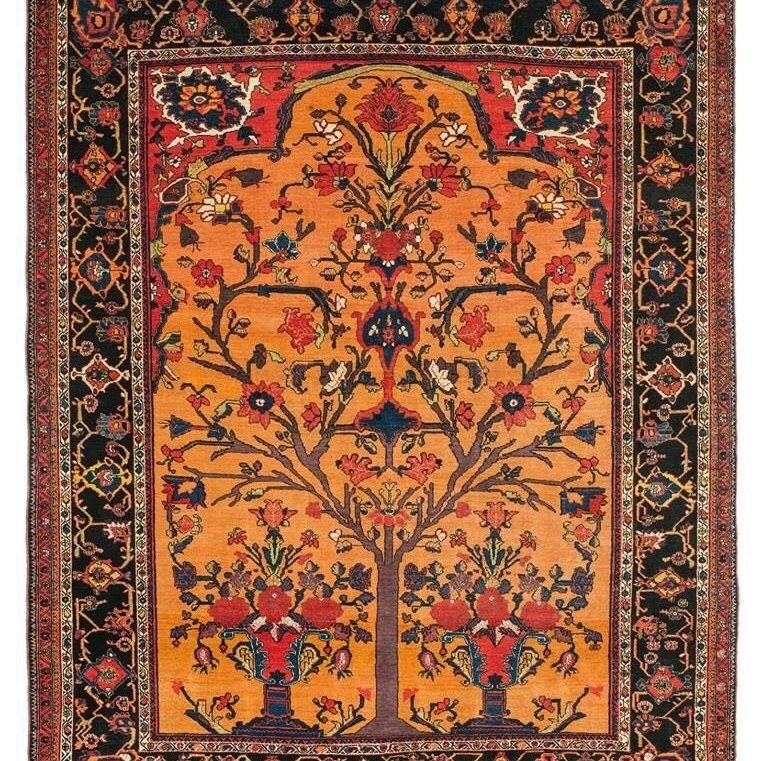 They had branches in Yazd, Tehran, Isfahan, Shiraz, Kerman, Bandar Abbas, Rafsanjan, Bombay, London and later New York. 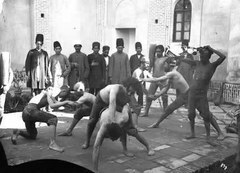 They were extremely successful and powerful and also supported the Constitutional Revolution in Qajar times. Unfortunately competition from banks outside Iran, no official government support from inside Iran, suspicious deaths of some their branch managers and some unsavory practices from competitors, caused the company to close their doors in 1911. 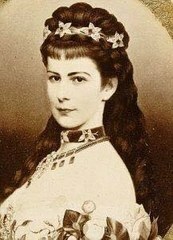 Another famous banking family in Iran at the same time was the Tumanian family. They were of Armenian origin. Around 1785 in the Armenian village, Vaiqan Arasbaran in Karadag county, lived a farrier (horse shoe maker) named Malik Sarkis. His horse shoes were of exceptional quality and soon he became well-known. 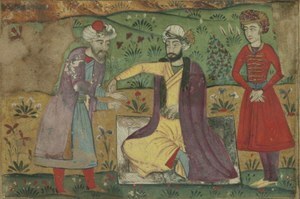 After his death his son, Tuman, took over the father's business and with the family's fame for extraordinary workmanship reaching the city of Tabriz, Tuman realized that he could double his profits by exchanging his horse shoes for product from Tabriz that he would then sell in turn in his own and surrounding villages. 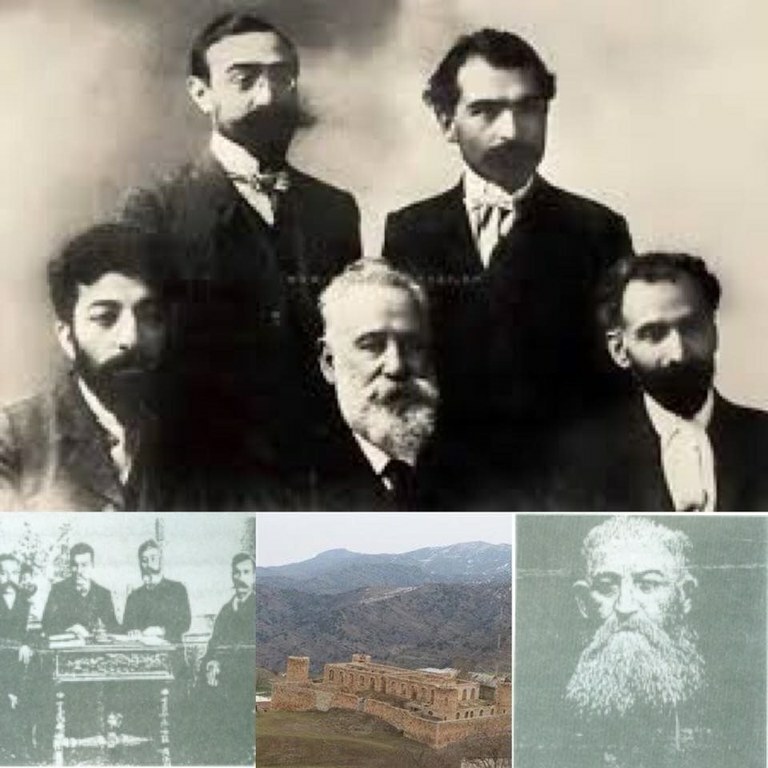 When his son, Harotion Tumanian, joined the business they moved from Vaigan to Tabriz in 1840 where they purchased a house in Liliabad which was known as the Armenian suburb of Tabriz. They opened a small shop in the bazaar of Tabriz called the Tumaniants Brothers and were joined by two brothers-in-law of Harotion. After the death of Tuman, Harotion joined by his 4 sons and 4 sons-in-law expanded the business and opened branches in Urumieh, Bonab, Rasht, Ardabil, etc. They realized later on that they could also do business in Baku by exchanging wool, cotton, silk and nuts from Iran with gold and silver from Russia. 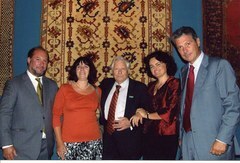 This prompted them to open a branch in Moscow also run by family members. 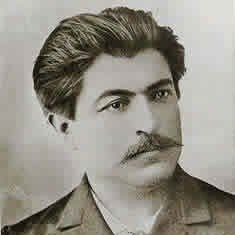 Sarkis Tumanian took the business to the next level when he ordered two ships from Sweden in 1889, that was used to transport goods exchanged between Iran and Russia. They later invested money in the oil companies for Russia and Iran and they became involved with coin production by supplying the gold and silver needed for this in Iran. 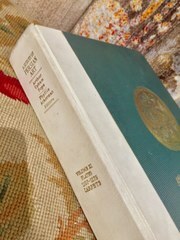 In 1918 they were unofficially accepted as the semi-official bank of Iran in the absence of any official Iranian banks. Unfortunately during the Russian Revolution in 1917 they lost all their Russian assets and because of this, Iranians banking with them in Iran, fearful of losing their deposits rushed to withdraw their cash. 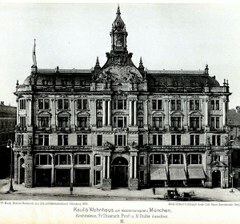 Even though the Tumanian bank could return all the monies deposited by the people, they decided to close their doors in 1933. 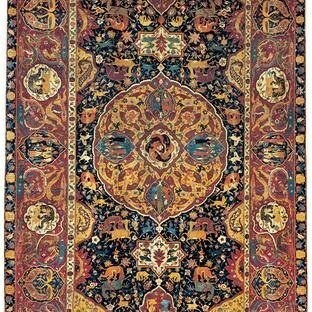 Most of these banking families, including the Jahanians and Tumanians, spent much of their time and fortune to order and export Persian carpets across the globe. It was not just a symbol of their wealth, influence and importance but it was also a way to ensure the continuity of this ancient and native Iranian art form as well as ensuring that this art form will continue to be used as one of the safest commodities of all time. 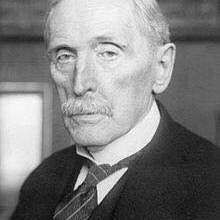 After the Russian Revolution many Russian banks opened branches in Iran and Britain was also given rights to open the first official Royal bank in Iran. 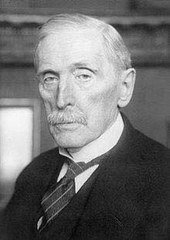 Other banks that were active in Iran were banks from Germany and despite Reza Shah's preference to deal with Germany, the Iranians never supported it. 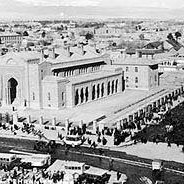 The Ottoman Empire Bank briefly opened branches in Iran in 1923 in Tehran, Hamadan and Kermanshah. The Sepah Bank was opened in 1926 supported by the government of Iran as the banker for the pension funds of army personnel of Iran. Three years later the National Bank opened and this gave an opening for many other banks to open in Iran resulting in 27 banks operating in Iran in 1959, 10 government banks and 17 privately owned banks. After the Iranian Revolution in 1979 all banks became state-owned and new banks were formed by merging some of these banks. 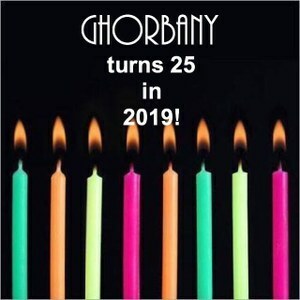 Ghorbany turns 25 in 2019! We are super excited for our upcoming birthday! 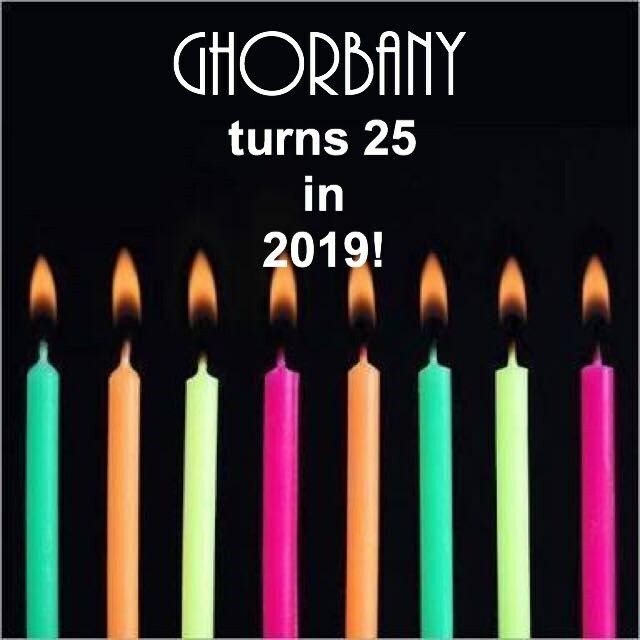 Turning a quarter of a century is nothing short of a dream come true for all of us at Ghorbany Carpets! We have lots planned so watch this space! 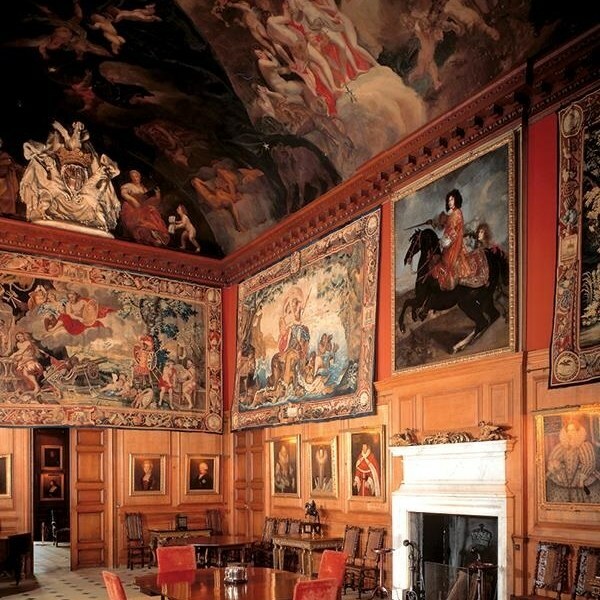 In the newly renovated Dumfries House of Prince Charles in Scotland a special room has been made to showcase tapestries specifically attached to the Gobelins Manufactory from France circa 1700. 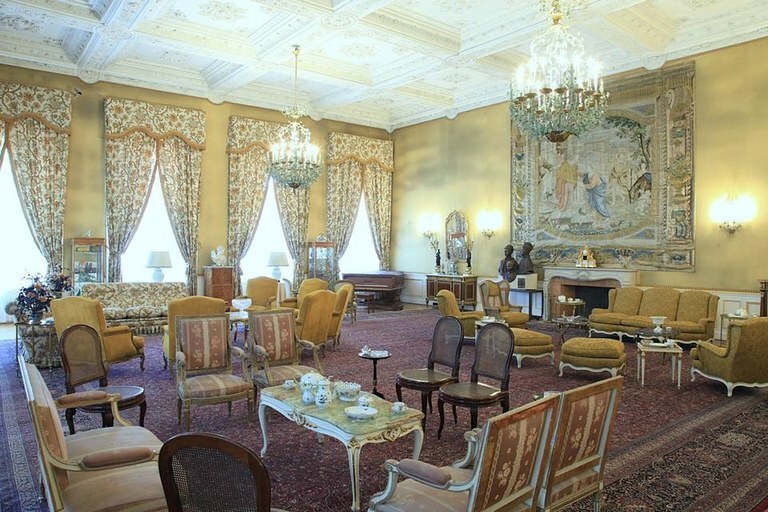 It is said that four tapestries housed in this room was presented by Louis XIV to an ancestor of the seventh Marquess of Bute, former owner of Dumfries House. 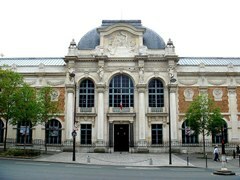 The Gobelins Manufactory at that time was so successful that its main produce was chiefly for royal use. The company not only made tapestries but it also produced upholstery. 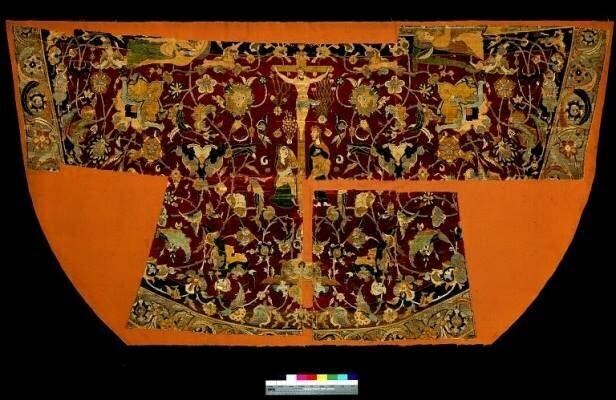 What made the Gobelin family very wealthy however, was, scarlet dye. The first head of the firm was named Jehan (d. 1476) who discovered a peculiar kind of scarlet dyestuff and he expended so much money on his establishment that it was named by the common people la folie Gobelin. To the dye-works there was added in the 16th century a manufactory of tapestry. 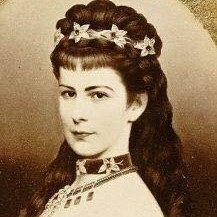 The family's wealth increased so rapidly that in the third or fourth generation some of them forsook their trade and purchased titles of nobility. The name of the Gobelins as dyers cannot be found later than the end of the 17th century. 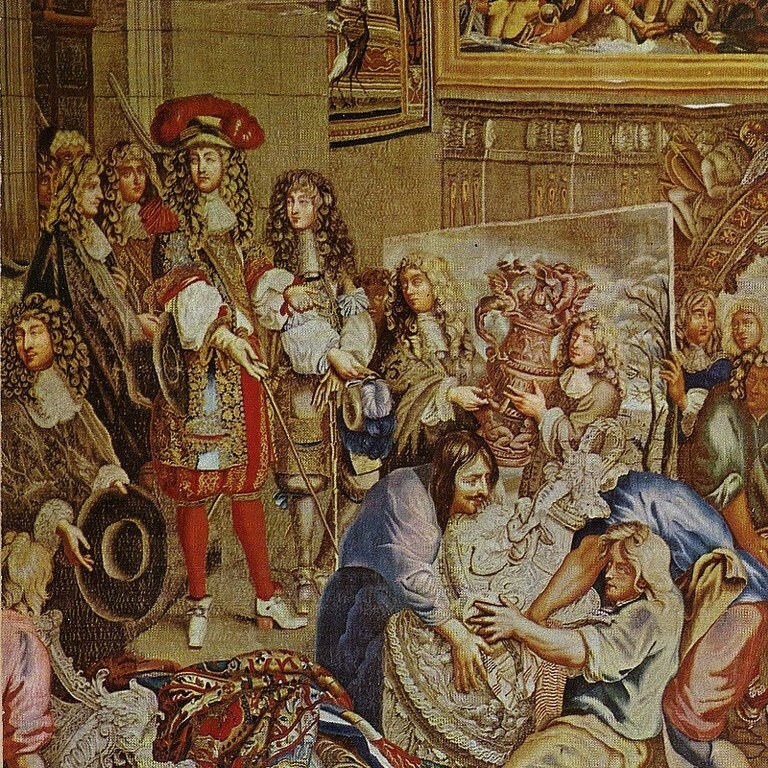 In 1602, Henry IV of France rented factory space from the Gobelins for his Flemish tapestry makers on the current location of the Gobelins Manufactory adjoining the Bièvre river. In 1629 the sons, Charles de Comans and Raphaël de la Planche, took over their fathers' tapestry workshops and in 1633 Charles was the head of Gobelins manufactory. 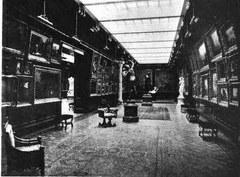 Their partnership ended around 1650 and the workshops were split into two. 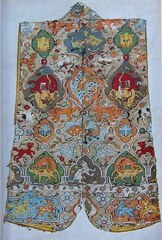 Tapestries from this early, Flemish, period are sometimes called pre-gobelins. In 1662, the works in the Faubourg Saint Marcel, with the adjoining grounds, were purchased by Jean-Baptiste Colbert on behalf of Louis XIV and transformed into a general upholstery manufactory, the Gobelins Manufactory. 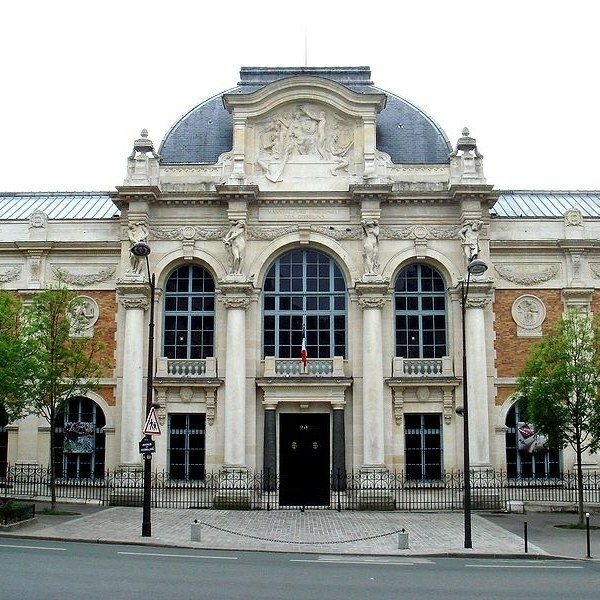 Today the manufactory consists of a set of four irregular buildings dating to the seventeenth century, plus the building on the avenue des Gobelins built by Jean-Camille Formigé in 1912 after the 1871 fire. 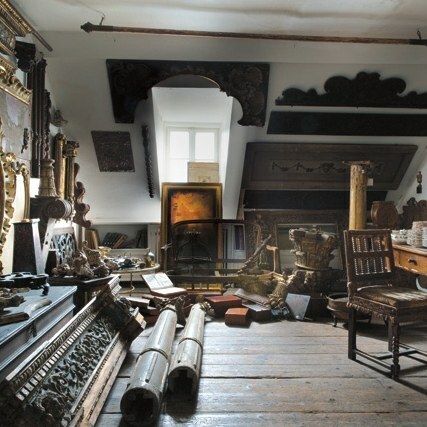 They contain Le Brun's residence and workshops that served as foundries for most of the bronze statues in the park of Versailles, as well as looms on which tapestries are woven following seventeenth century techniques. 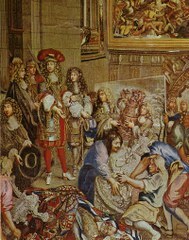 The Gobelins still produces some limited amount of tapestries for the decoration of French governmental institutions, with contemporary subjects. 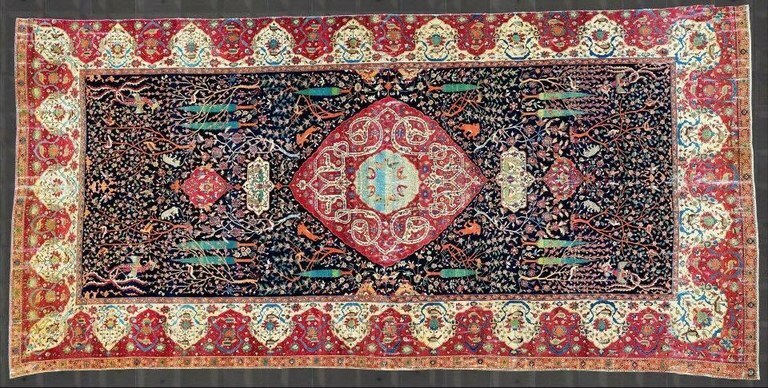 We start our journey into the history of the Amu Oghli carpets of Mashhad in the village of Kahnamu, located in the Sahand Rural District in the Central District of Osku County, East Azerbaijan Province, Iran. In the 2006 census its population was only 2,210 from 644 families. 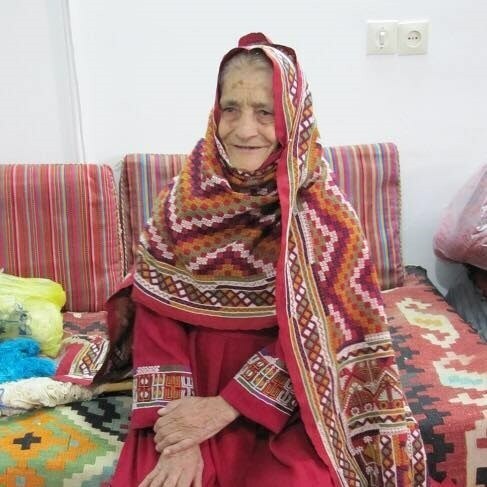 1- This village is the only major silk weaving centre in Iran that produces its own silk, since ancient times. 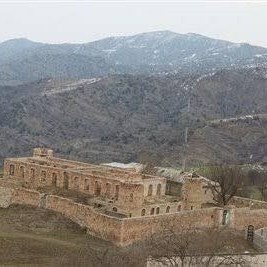 2- King Naseredin shah of Qajar was born there. 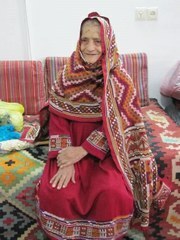 3- Mr Muhammad Kahnamuie, or better known as Amu Oghli, was born there and he was a master silk weaver of the village. Our article revolves around fact 3, Amu Oghli. 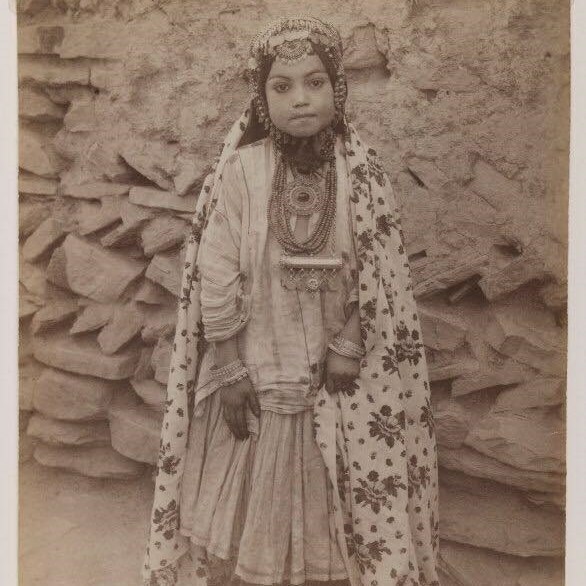 He immigrated to Mashad in Khorasan around 1835 and was one of the senior Azari people in Mashad. Out of respect everyone called him Amu Oghli (translating to ‘big cousin’) and he chose that as his new surname. He started making and selling carpets in Mashad and soon his two sons, Mr Abdul Muhamad Amu Oghli (1872-1938) and Mr Alikhan Amu Oghli (1893-1958) and lesser known godson Mr Musa Amu Oghli, joined him to establish one of the best names in the Persian carpet workshop industry. 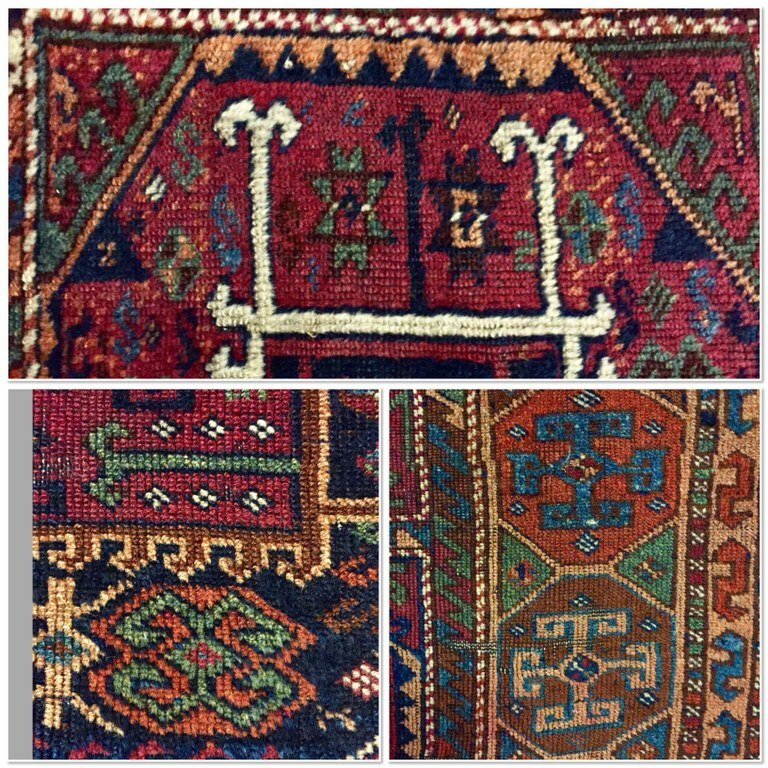 The brothers visited England to view some of the Safavid carpets available there to get inspiration for designs and they made a replica of Ardebil carpet at the V&A Museum afterwards. They also bought a book on Safavid carpets that provided more inspiration for designs and they ordered Mr Abdul Hamid Sanaat Negar (a young designer from Kerman with talent out of this world, employed by the company) to alter the designs to suit the tastes of the new era. 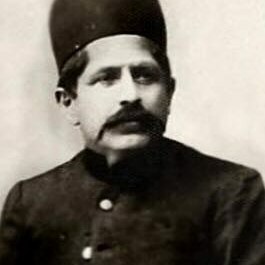 Mr Abdul Muhamad Amu Oghli established workshops in Mashad,Dorokhsh,Muhammad abad (his manager was Mr Khalil Khadivi) and Torghabeh. 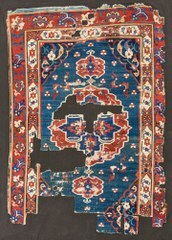 Many carpets produced in these workshops had the Amu Oghli signature on top. 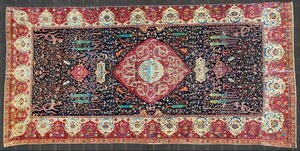 His brother, Mr Alikhan, had his workshops in Shandiz and Golmakan with the signature, Alikhan Amu Oghli 110, at the bottom of his carpets. His workshops were closed for 6 years between 1948-1954 and he died while he was still finishing a carpet ordered by parliament of the time. His son, Mr Changiz Amu Oghli, carried on his legacy with a different signature. These workshops got orders from so many wealthy families in Mashad, such as Mr Kuze Kanani (super wealthy tobacco tycoon of Mashad with a design attributed to him), that it resulted in their soaring popularity and eventually the royal palaces started ordering from them as well. 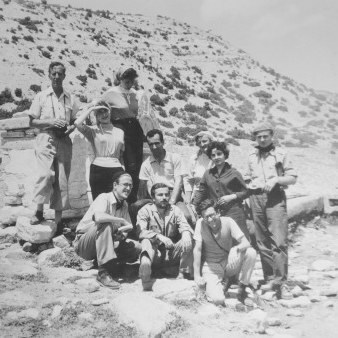 Reza Shah Pahlavi was in love with this family and he ordered so many master pieces from them and his son, Muhammad Reza Shah, followed suit. 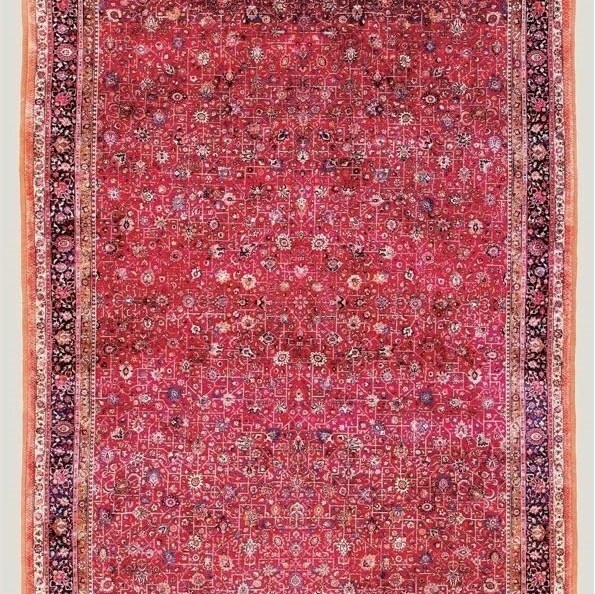 The name Amu Oghli gave life to Mashadi carpets and many workshops after them cashed in on their fame and style. 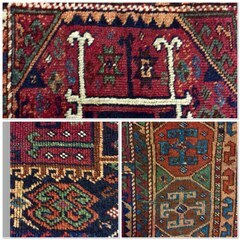 To understand the signatures of Amu Oghli one need to know each single style of weaving (including colour choices and fineness, eg. 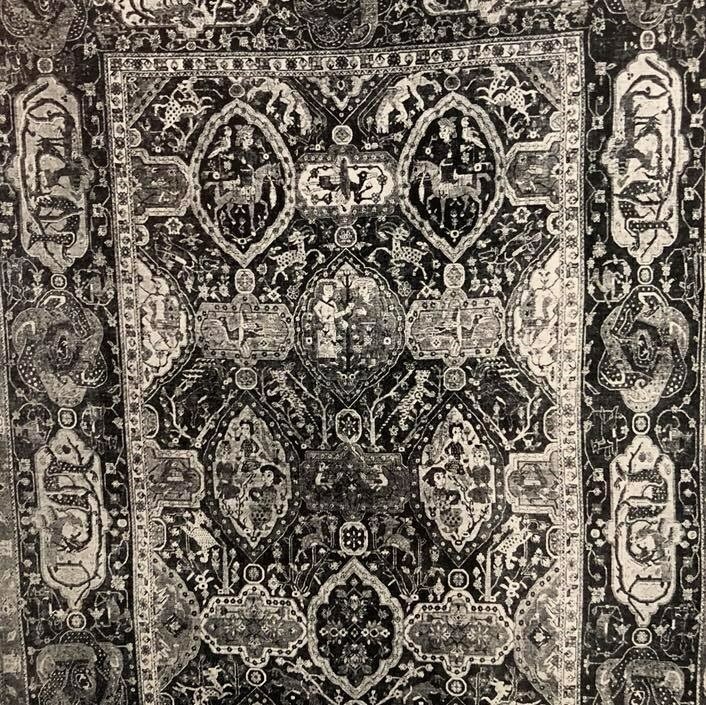 usually carpets from Mr Abdul Muhammad are the finest even up to 150 raj) of the father, the two sons, the one godson and the all grandchildren’s workshops (and obviously the copies made too)! Joseph Marie Charles (“Jacquard”) was born into a conservative Catholic family in Lyon, France on 7 July 1752. 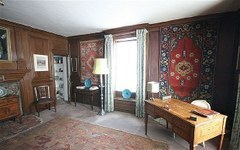 His father was a master weaver and after his death Joseph inherited his father’s business and estates. 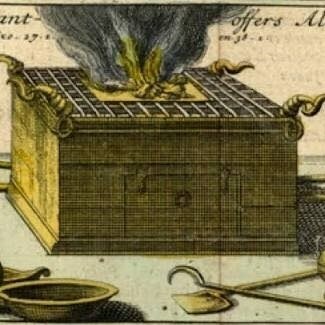 By 1800, Joseph began inventing various devices. He invented a treadle loom in 1800, a loom to weave fishing nets in 1803, and starting in 1804, the “Jacquard” loom, which would weave patterned silk automatically. 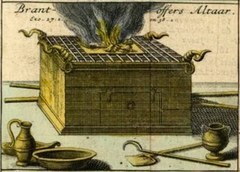 However, these early inventions did not operate well and thus were unsuccessful. 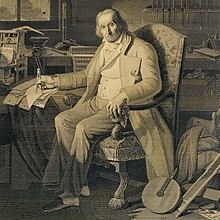 In 1801, Jacquard exhibited his invention at the Exposition des produits de l'industrie française in Paris, where he was awarded a bronze medal. In 1803 he was summoned to Paris and attached to the Conservatoire des Arts et Metiers. 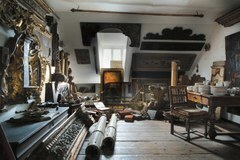 A loom by Jacques de Vaucanson on display there suggested various improvements in his own, which he gradually perfected to its final state. The Jacquard Loom is a mechanical loom that uses pasteboard cards with punched holes, each card corresponding to one row of the design. Multiple rows of holes are punched in the cards and the many cards that compose the design of the textile are strung together in order. It is based on earlier inventions by the Frenchmen Basile Bouchon (1725), Jean-Baptiste Falcon (1728) and Jacques Vaucanson(1740). 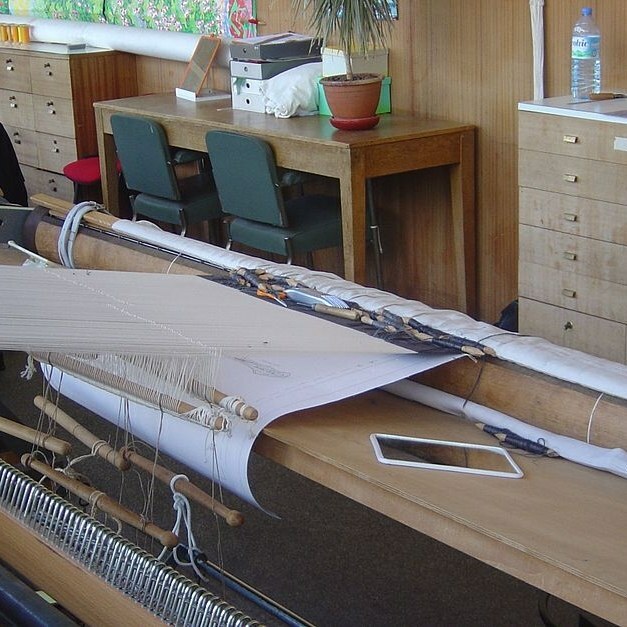 To understand the Jacquard loom, some basic knowledge of weaving is necessary. Parallel threads (the “warp”) are stretched across a rectangular frame (the "loom"). 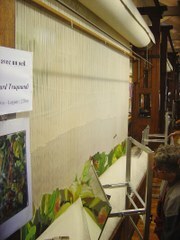 For plain cloth, every other warp thread is raised. Another thread (the “weft thread”) is then passed (at a right angle to the warp) through the space (the “shed”) between the lower and the upper warp threads. 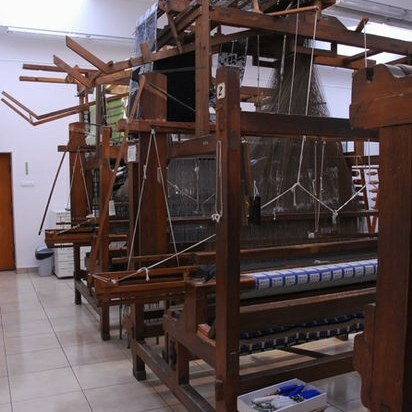 Then the raised warp threads are lowered, the alternate warp threads are raised, and the weft thread is passed through the shed in the opposite direction. 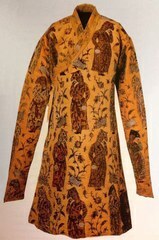 With hundreds of such cycles, the cloth is gradually created. 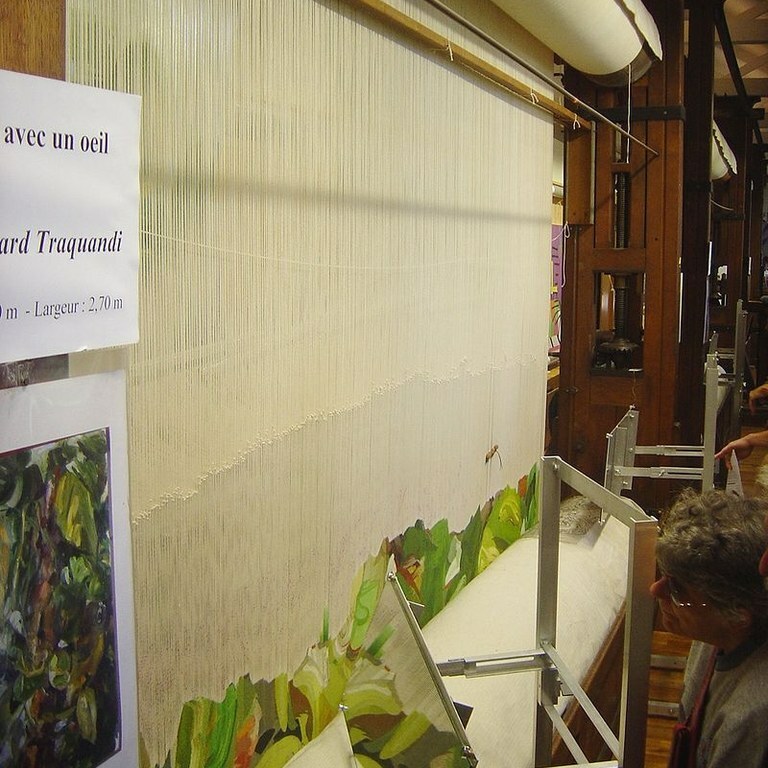 The potential of Jacquard’s loom was immediately recognized. On April 12, 1805, Emperor Napoleon and Empress Josephine visited Lyon and viewed Jacquard’s new loom. 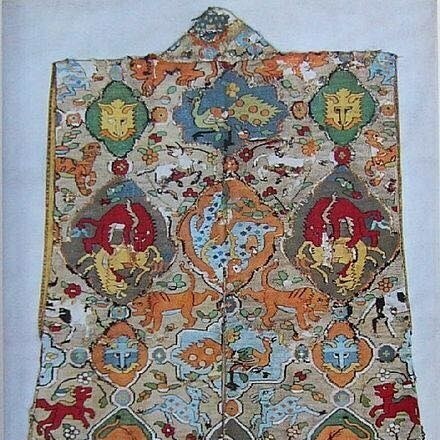 On April 15, 1805, the emperor granted the patent for Jacquard’s loom to the city of Lyon. In return, Jacquard received a lifelong pension of 3,000 francs; furthermore, he received a royalty of 50 francs for each loom that was bought and used during the period from 1805 to 1811. Although his invention was fiercely opposed by the silk-weavers, who feared that its introduction, owing to the saving of labour, would deprive them of their livelihood, its advantages secured its general adoption, and by 1812 there were 11,000 Jacquard looms in use in France. 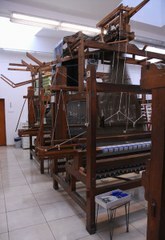 Initially few Jacquard looms were sold because of problems with the punched card mechanism. 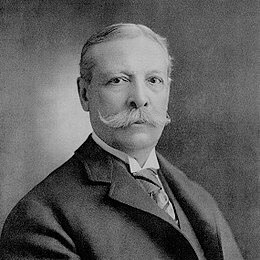 Only after 1815 — once Jean Antoine Breton had solved the problems with the punched card mechanism — did sales of looms increase. 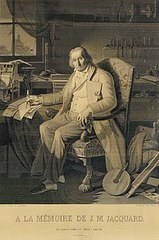 Jacquard died at Oullins (Rhône), 7 August 1834. Six years later, a statue was erected to him in Lyon, on the site where his 1801 exhibit loom was destroyed. Not only did the Jacquard loom revolutionize the weaving industry, but it also created the foundation for future computer programmes. 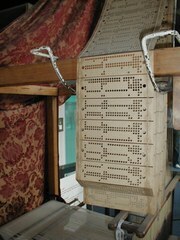 The Jacquard head used replaceable punched cards to control a sequence of operations. It is considered an important step in the history of computing hardware. 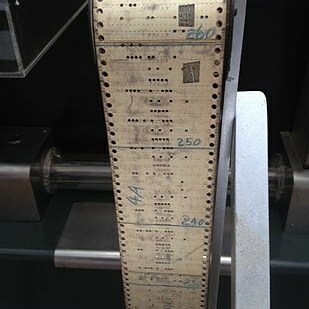 The ability to change the pattern of the loom's weave by simply changing cards was an important conceptual precursor to the development of computer programming and data entry. 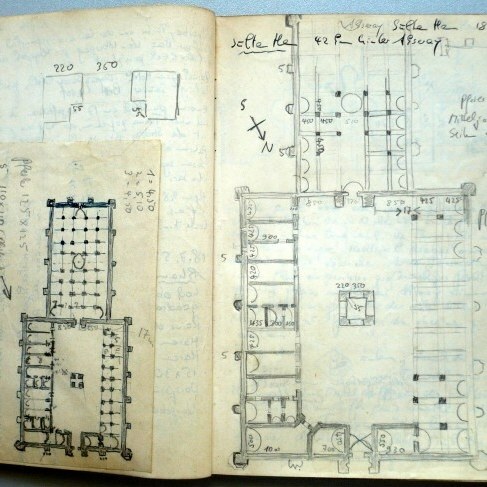 Charles Babbage knew of Jacquard looms and planned to use cards to store programs in his Analytical Engine. In the late 19th century, Herman Hollerith took the idea of using punched cards to store information a step further when he created a punched card tabulating machine which he used to input data for the 1890 U.S. Census. 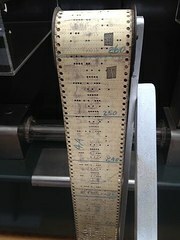 A large, punched-card-based data processing industry developed in the first half of the twentieth century, dominated by the International Business Machine corporation (IBM), with its line of unit record equipment. 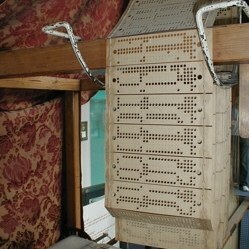 The cards were used for data, however, with programming done by plugboards. Lehmann Bernheimer (27 December 1841 - 29 May 1918) He was born in Buttenhausen in Münsingen, Württemberg, the third child of Meier Bernheimer (1801-1870) and his wife Sarah, née Kahn (1803-1881). 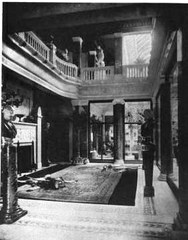 In 1887,Age 46 Bernheimer bought a small coffee house and beer garden, owned and run by an Englishman, and called the English Café. 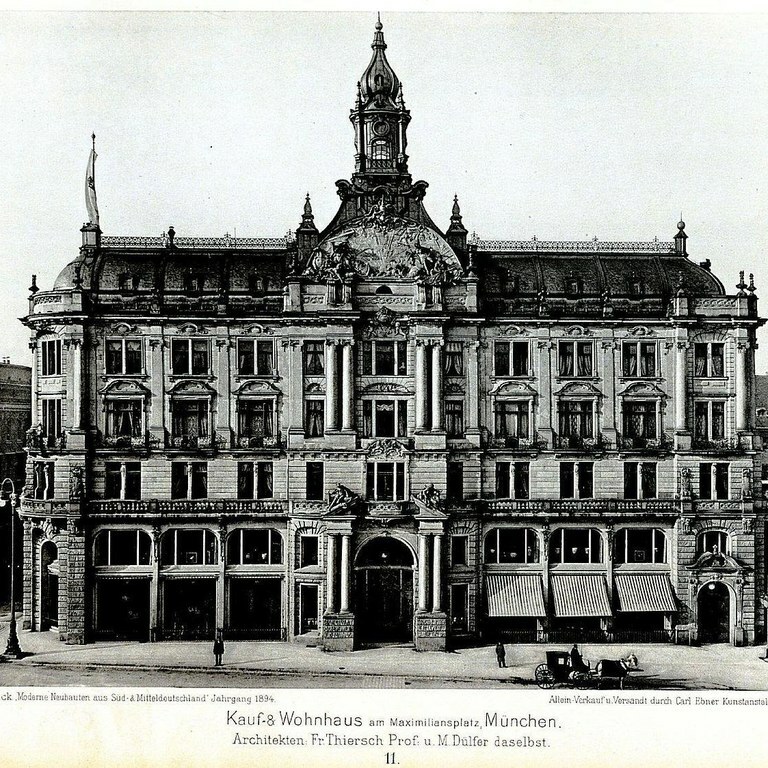 In its place was built the Bernheimer-Haus, which was opened in December 1889 by Prince Regent Luitpold. 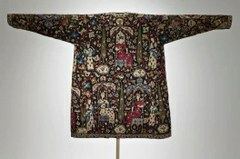 Initially the focus was on high-quality textiles, with the manufacture of luxury goods being slowly added. 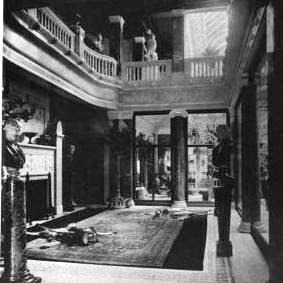 After a fire in 1897, the building was extended and antiques, tapestries and carpets were added.In 1918, his son Otto Bernheimer took over, but Following Kristallnacht on 9–10 November 1938, which saw the huge plate glass windows of the Bernheimer-Haus smashed,he and his family were sent to Dachau concentration camp, and the Mexican government intervened, as he was the Mexican honorary consul in Munich. 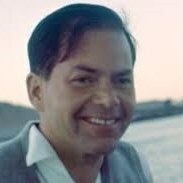 Hermann Göring, a Bernheimer client, did a deal whereby they bought his niece’s Venezuelan coffee plantation which was struggling, and were allowed to emigrate there, and also had to take Göring's aunt and her Jewish husband along, and support them until they died . 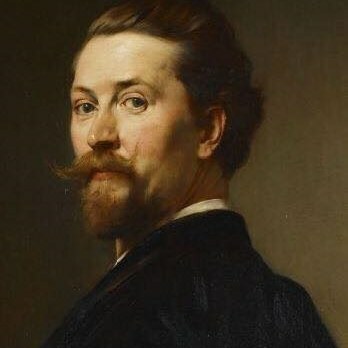 After the war, Otto returned, and in 1948, moved into the art trade. 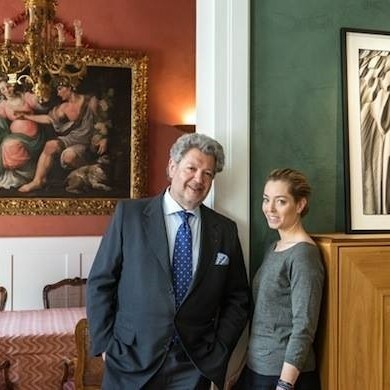 In 1977, Otto's grandson Konrad Bernheimer born 30 August 1950 took over (his father committed suicide in Venezuela) and renamed the business Bernheimer Fine Old Masters, as the company was specializing in Old Master paintings from the 16th to 19th centuries. 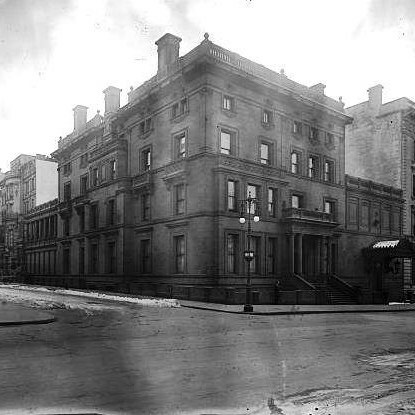 In 1987, the Bernheimer-Haus was sold by Konrad to pay his co-heirs. 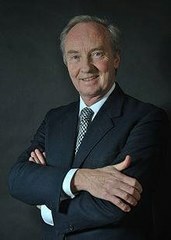 As well as being the chairman and owner of Bernheimer Fine Old Masters, Munich, he owns Colnaghi in London, founded in 1760, and the world's oldest gallery, which he bought in 2002. 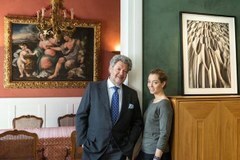 He is a board member of The European Fine Art Foundation, and chairman of its fine art division, Pictura, since 2004. 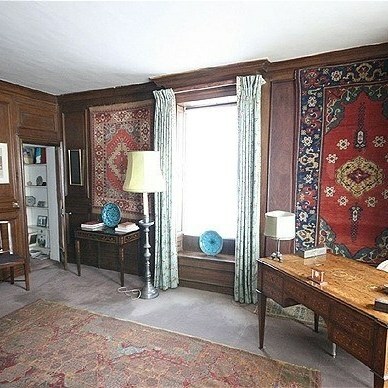 The Bernheimer sale of works of art from Burg Marquarstein at Sotheby's in London in November 2015 realised £2,371,000 and his carpet collection which was sold at Christie's London, February 14, 1996 was exceptional. His daughter Blanca Bernheimer has dealt in fine art photography since 2005. 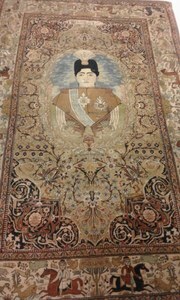 When carpets reveal history and mystery! 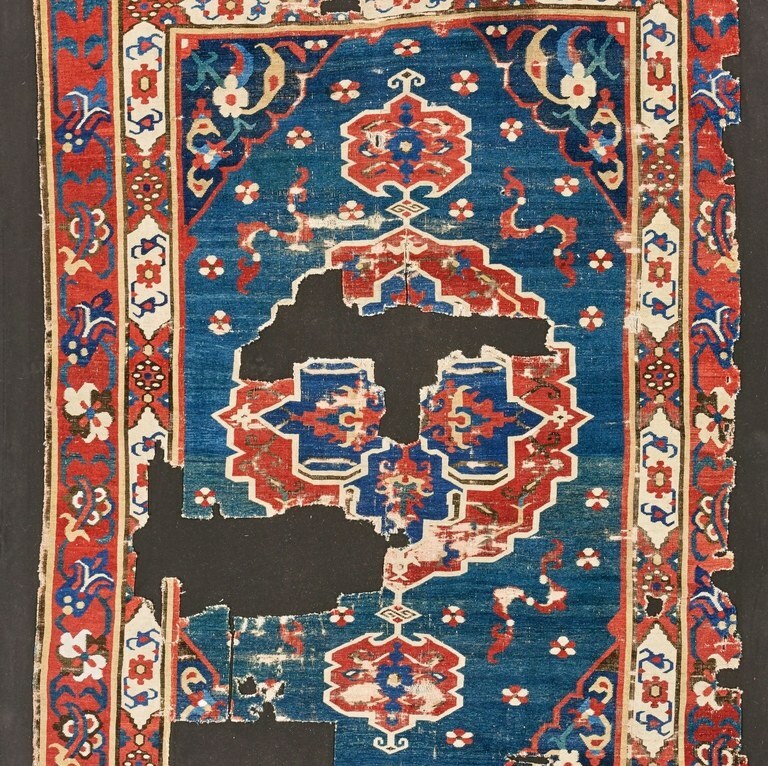 In the upcoming Rippon Boswell auction on Saturday 02 June 2018 at 3 p.m there is a Bachtiari Khan carpet in Lot 50, Dimensions 204 x 159 cm, Age um 1900 with Estimated Value of EUR 12,500. 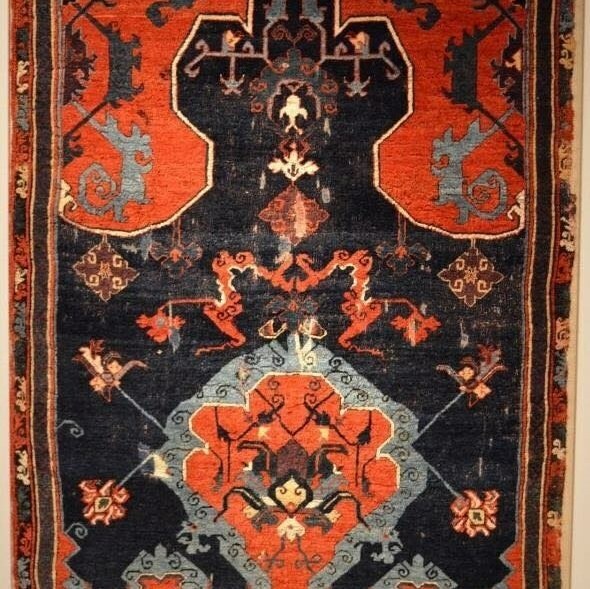 On 21 April 2015 a very similar rug sold at a Christies Auction, Dimention:186x138, sold for GBP7500 ( EUR8500). 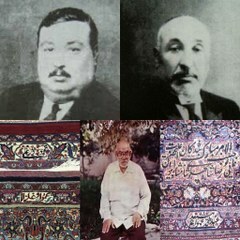 Both rugs were ordered by a Bakhtiari khan called Sultan Muhammad Khan Moein Humayun (or as his other title Sardar Ashja) (born 1862 , death 1924 in Paris), whose father and uncle and many other family members were the chiefs of a Bakhtiari tribe in South West of Iran. 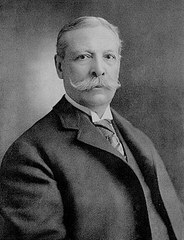 He himself became the governor of Isfahan five times and when he got sick he went to Tehran and later France where he died. 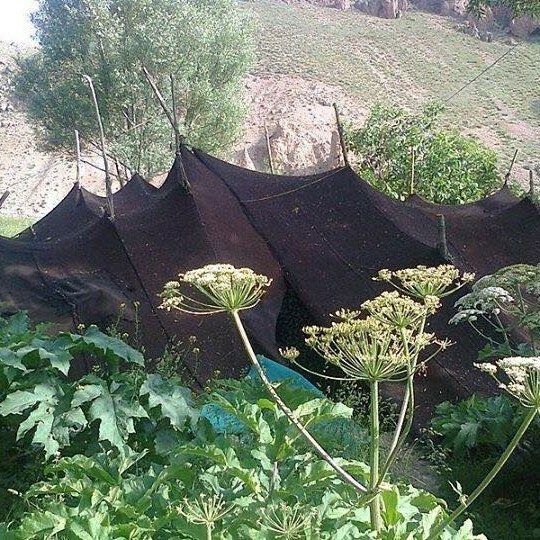 The Baḵtīārī nomads move between a summer abode (yeylāq) in the high mountains (summit, Zardakūh 4,548 m) and a winter abode (garmsīr) in the western foothills adjoining the Ḵūzestān plain. The ecological boundary between the two zones coincides roughly with the course of the Āb-e Bāzoft. Thus the Baḵtīārī country falls into two different administrative provinces: Čahār Maḥāl, where the summer quarters lie, and Ḵūzestān, in which the winter quarters are included. The seasonal migrations (called bār) made by different sections of the tribe vary in length and can reach 300 km. The migration into the mountains takes place in springtime when the weather and the vegetation are at their best; it lasts longer (15 to 45 days) than the reverse migration (8 to 30 days). The migration routes are seldom, if ever, changed, because in this region there are only five or at best seven cols over which the Zagros ranges can be crossed; they lead to campsites (javārgāh) which are likewise almost always the same, being fixed by longstanding conventions. As is well known, these routes are extremely arduous. The nomads suffer frequent accidents and losses of livestock when they clamber over snow-covered cols and through rock-encumbered gorges and when they either swim or float on rafts held up with inflated goatskins across the Kārūn and other raging rivers at the time of the snow-melt. 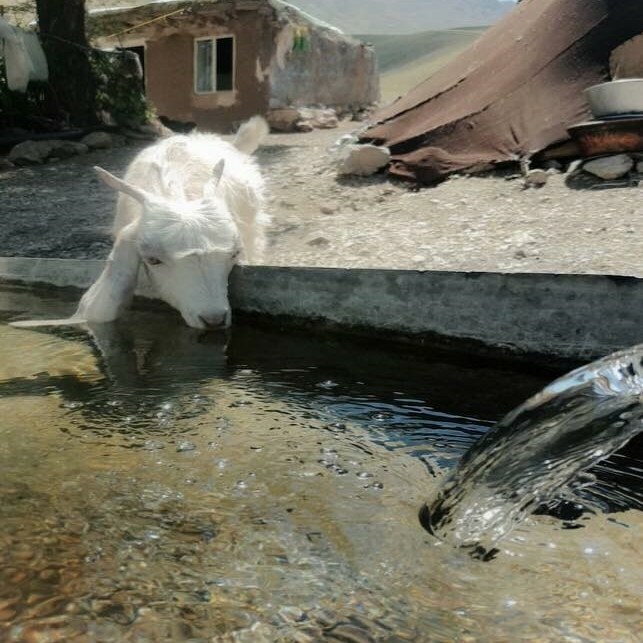 Despite all these difficulties, seasonal migration is necessary because of the prevalence of cold and snow in the yeylāq from October to April and heat and drought in the garmsīr from May to September, and often also the exhaustion of the pastures after several months of intensive use. 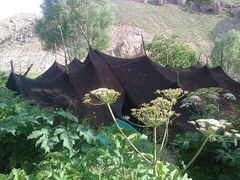 Other possible ways to solve the problem have been suggested, for example to combine sheep folding with fodder crop cultivation and short-range transhumance; but for the time being, in the absence of any satisfactory alternative, nomadism remains the only feasible technique for efficient pursuit of livestock raising in this region. In Iranian mythology, the Bakhtiaris are considered to be descendants of Fereydun, a legendary hero from the Iranian national epic, Shahnameh. They are also considered to be directly descended from Cyrus the Great. 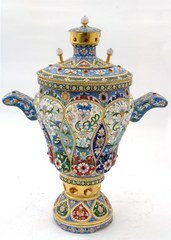 Minakari or enamelling is one of the most glorious arts of Iran. It is the art of painting the surface of metals such as gold, silver and copper (sometimes glass and ceramics too) by glazing colours and then firing it in a furnace. According to Orientalist scholar, Arthur Pope, minakari dates back to 1,500BC. Its practice on metal appears in 600 – 400 BC. From among samples of minakari in Ancient Persia there is a pair of earrings that was discovered in Nahavand dating from 800 – 700 BC, a gold Achaemenid Era arm band with minakari in the Victoria and Albert Museum and Sassanid plates with minakari in the Islamic Arts Museum in Berlin. Although the origins of enamel are uncertain, its history and delicate aesthetics are strongly rooted in Iran. Ancient Persians seem to have used the technique to colour and ornament metal surfaces fusing brilliant colours into them. They probably gave it the name of minakari, coming from minoos – sky, to the wonderfully blue pieces of their art. Evidence from Mesopotamia and China suggests that Persia was the chief source of cobalt ores that produced the colour blue (for less than lapis lazuli) in the ancient world until the late Middle Ages. 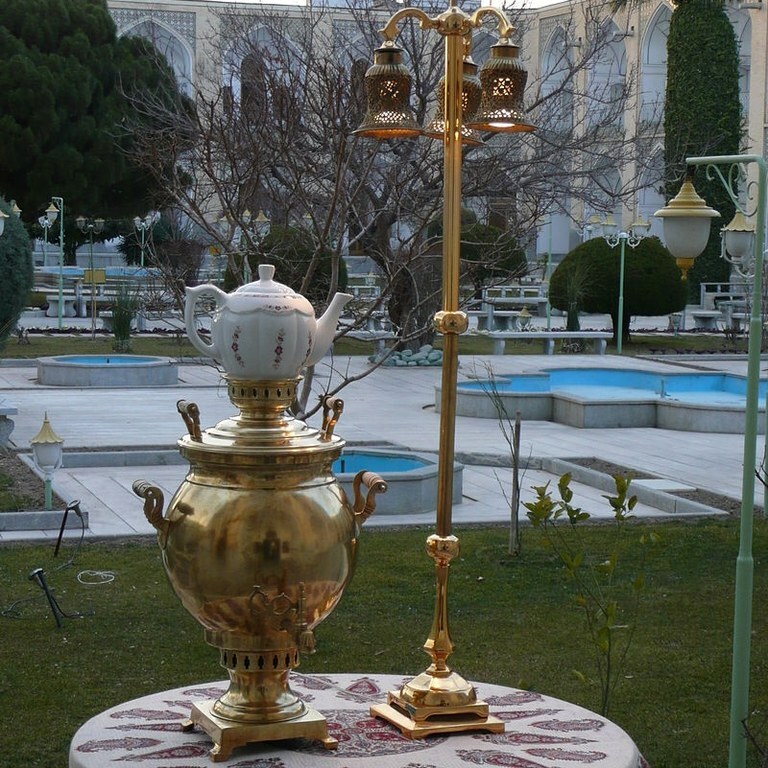 The local artisans in Isfahan coincide with Iranian historians in that the 14th century trade along the routes of the Mongol empire took it to faraway countries, spreading the technique across Eurasia. 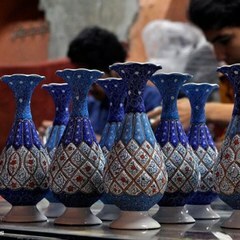 The origin of the blue and white decorative style is thought to lie in Persia when craftsmen in Basra sought to imitate imported white Chinese stoneware with their own tin-glazed, white pottery and added decorative motifs in blue glazes that had been developed by pre-existing Mesopotamian cultures. 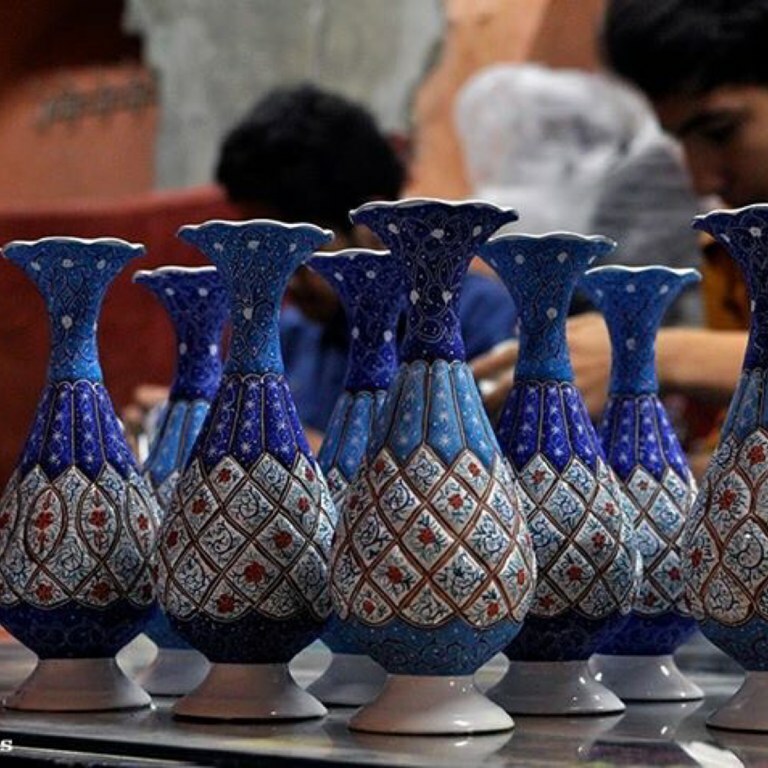 Although blue was always popular in Persia cobalt blue glaze became popular in Islamic pottery during the Abbasid Caliphate, during which time the cobalt was mined near Kashan, Oman, and Northern Hejaz. 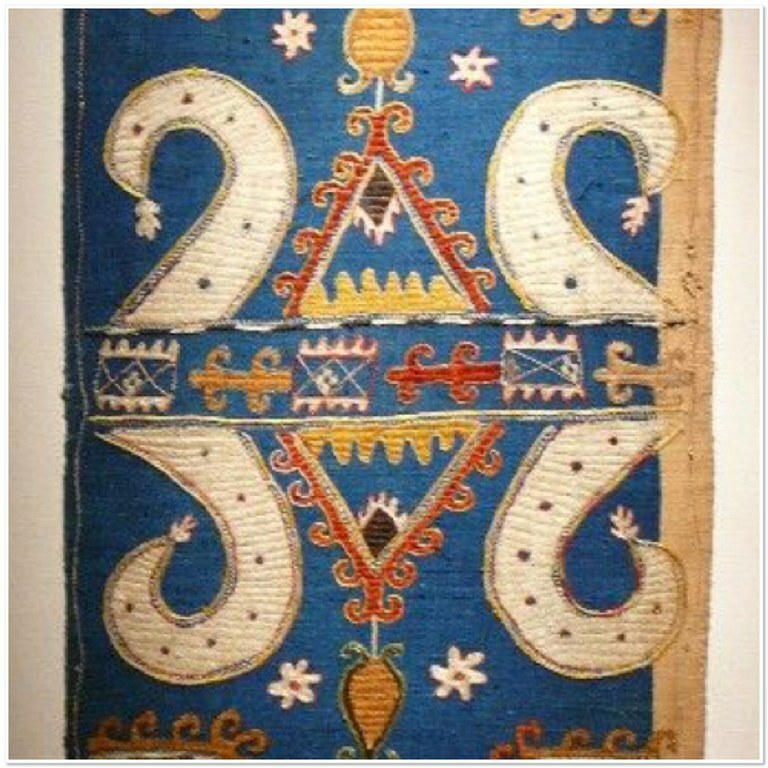 Such Abbasid-era "blue and white" pieces have been found in present-day Iraq dating to the 9th century A.D.
During the same period the first Chinese blue and white wares were produced in Henan province, China during the Tang Dynasty, albeit in very small quantities. 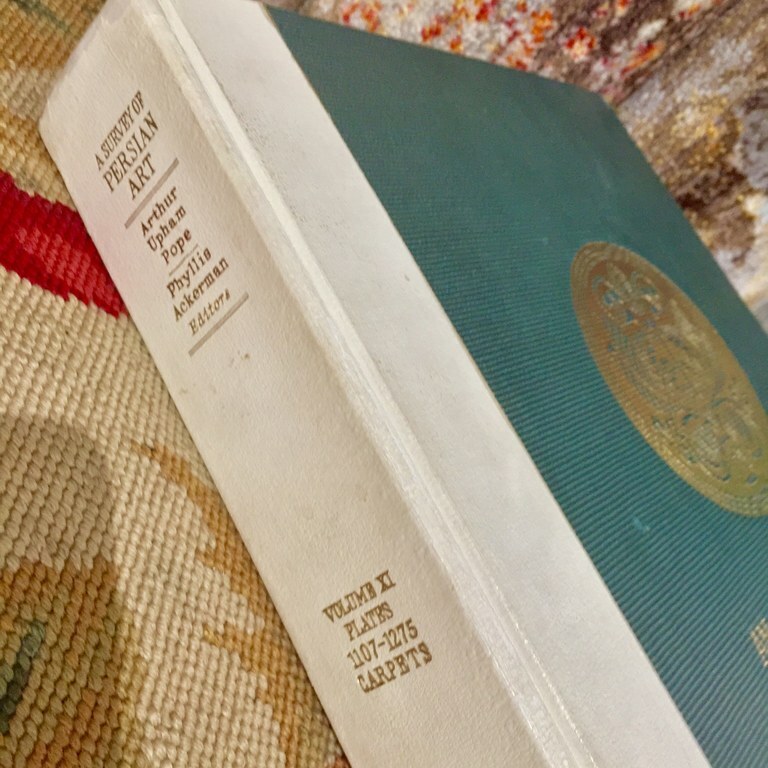 It is difficult to determine who influenced who, but our bet is on the Persians influencing Chinese artisans because in Persia blue was a favourite in glazing and China green was the favourite, Persia was also the source of blue used in glazing. Whatever the answer, blue and white pottery ceased after the Tang Dynasty when the artistic emphasis of Song Dynasty pottery was on subtle glaze effects and graceful shapes. What is clear is that in the Song Dynasty which tended to uphold the esthetics of conventional Confucianism, underglaze blue was not at all popular; Confucian esthetics emphasized simplicity and the underglaze blue designs were judged to be too ornamental. Later, in China, a style of decoration based on sinuous plant forms spreading across the object was perfected and most commonly used. 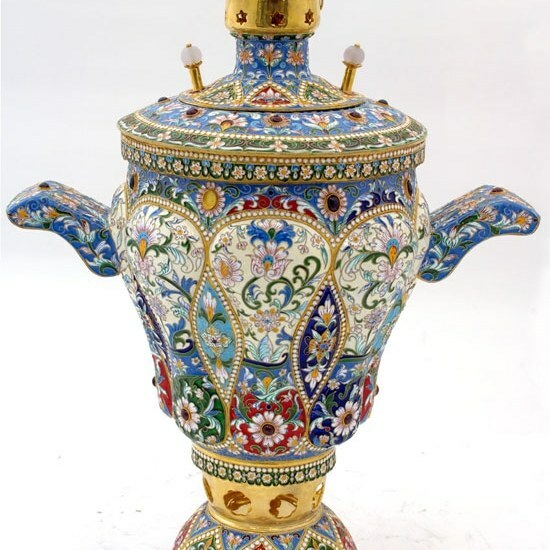 It was thanks to the Mongol Yuan Dynasty that blue and white decoration (a typically Persian favourite) first became widely used in Chinese porcelain in the 14th century after the cobalt pigment for the blue began to be imported from Persia, since the Mongol rulers revered Persian arts of all kinds. During their reign mass-production of fine, translucent, blue and white porcelain started at Jingdezhen, sometimes called the porcelain capital of China. 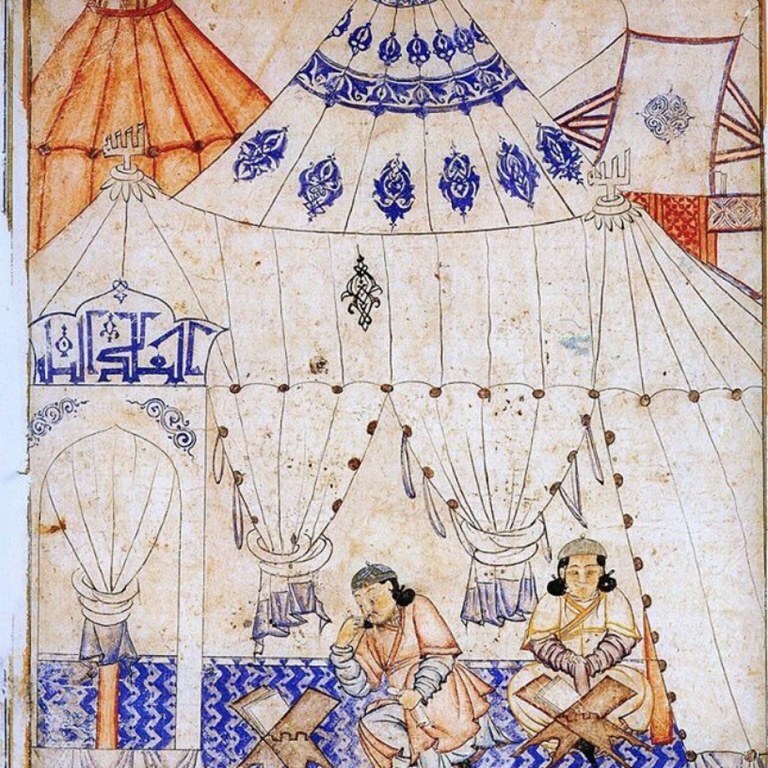 This development was due to the combination of Chinese techniques and Islamic trade. The new ware was made possible by the cobalt from Persia combined with the translucent white quality of Chinese porcelain. Cobalt blue was considered as a precious commodity, with a value about twice that of gold. 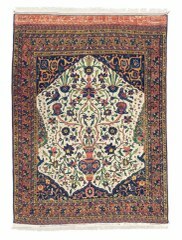 Motifs also draw inspiration from Islamic decorations. 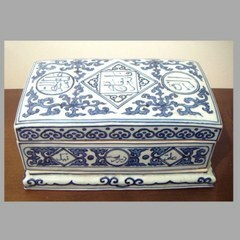 A large portion of these blue-and-white wares were then shipped to Southwest-Asian markets through the Muslim traders based in Guangzhou. With the advent of the Ming dynasty in 1368, blue and white ware was shunned for a time by the Court, especially under the Hongwu and Yongle Emperors, as being too foreign in inspiration. 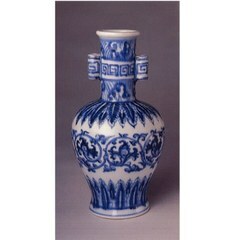 Blue and white porcelain however came back to prominence with the Xuande Emperor, and again developed from that time on. 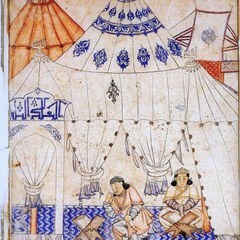 Some blue and white wares of the 16th century were characterized by Islamic influences, such as the ware under the Zhengde Emperor (1506–1521), which sometimes bore Persian and Arabic script, due to the influence of Muslim eunuchs serving at his court.